Tideway ramblings on the local birdlife, from estuary head (Upnor Reach) to estuary mouth (Queenborough Spit). This rather lengthy blogpost is the result of a long-planned post being amended for a different purpose, that also never went quite as planned. The local WeBS set up is in the process of being revamped. 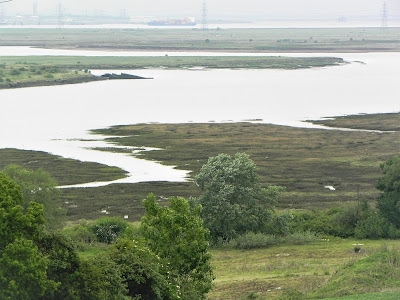 For many years the three hugely important estuaries of north Kent, the south Thames, the Medway, and the Swale, have had just one Local Organiser, working without a nominated assistant. Doing a sterling job, but one ultimately better suited to three individual L.O.s with each eventually, hopefully, having their own assistant. The relaunch has happened, and good luck to those involved. Although on the outside looking in, it has been good to be involved in the debate over the past couple of months leading up to the change. Plus there was a longstanding invite from some of the counters to come and talk at one of their WeBS meetings. The talk was originally to be about several Medway species but, after discussion, most of the talk was revolved around how to overcome some 'technicalities' in counting to help improve WeBS coverage locally; illustrated by one species- the Redshank. Priorities then evolved based on needs, and much of the talk switched to how to interpret WeBS online data online. Another story in itself for another time, right now though, here's the full Redshank story.. The first draft was written as a gale blew, on an afternoon many roosts would have been going under on high spring tides. The differences between the highest and lowest tides always impresses. Just a week before the Redshanks were loafing on the saltings during mundane neaps. On and on the cycle goes. Spring tide- a tide just after a new or full moon, when there is the greatest difference in tidal height between high and low water. Neap tide- a tide just after the first or third quarters of the moon when there is the least difference between high and low water. Redshank activity on both neaps and springs differs greatly, but difficulties for both ensure it is difficult to get an accurate estimate. 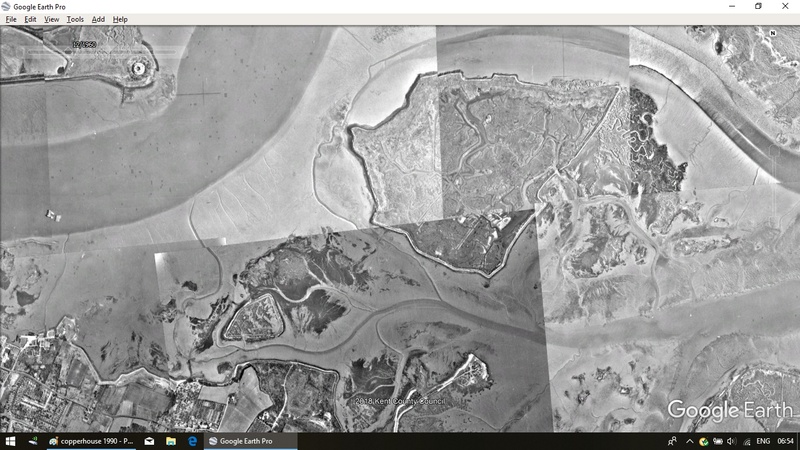 It is incredibly easy to lose large numbers out and around the Medway for long periods of the tidal cycle. This snapshot will be for the autumn. The productive time of year for Redshanks on many estuaries around our coast. Daylight hours are still quite long, giving the birds a minimum of one full tidal cycle to feed. Feeding should be good; the mudflats teeming with new life, prey should be plentiful where able to reach it. For Redshanks on the Medway, searching, in the main, for the tiny amphipod Corophium volutator and (just as tiny) young crabs, the wet edge of a creek or tideway is as good, if not better, than any open flat; the prey are more likely to be near the surface where water meets mud. Often musing on the reasons behind low counts, I first appreciated that Redshanks retreat deep into our creeks under windy conditions, I did not immediately register they would hole up for much of the time during good weather. As well as feeding along the creeks, why not loaf there? Out of sight of many predators. It enables a Redshank to save energy- and at certain times of the year this is vital. Winter, to be fit enough to survive the extremes. The balmy autumn? Just as vital. The behaviour section in 'BWP' opens with 'not highly gregarious'. What? Really? Peer in a tideway and find a few dozen close together, glance at a flat with a few hundred gathered, and it sure looks like they do. But this is a loose flock, many will be keeping a fair distance from others present. Those still feeding do not want others interfering. Small 'tight' groups may well be individuals tolerating each other; those perhaps preening or loafing. Watch long enough and these too will show aggressive behaviour towards each other if, say, one shuffles too close. And there are some that will hold a territory and will defend it until the flat is covered by the tide; no gatherings allowed here, thank you very much. Then you start to register they not only hug the creeks, they hide in the cord grass. Many adults on the Medway go through their annual complete moult in the autumn. They need to put a lot of energy into feather regrowth, so any unnecessary flight is costly, having as they do a fairly sizeable 'hole' in their wing while their flight feathers regrow. In any moderately large species, an annual moult has to be long. It will take over three months to grow a new set of feathers. It has a cost, so there has to be a balance. They need to be able to fly still, so flight feathers are replaced slowly, in sequence, pushing a gap, a 'window' down the wing (why many birds at rest show a white flash during autumn- the secondary trailing edge can be seen because there is a window in the primaries). This slow moult approach allows a wader options. Some species hold their ground for the duration, others might travel short distances south and west, others might start, then halt the moult (known as arresting), fly south with a mix of old and new flight feathers, then restart. And different populations of a single species might well do different things. They certainly do in Redshanks. Come the end of the breeding season (late June onwards), Redshanks are on the move. 'Our' breeding birds might not go far. Although only ringing here on the s. Medway for a couple of years now, already there is a record of a female ringed as a youngster in the nest from the Thames (Cooling) spending her adult moult period here on the Medway. Why might this be? Well, the s. Thames did lose a large percentage of saltings when the raised sea wall went in after the floods of 1953 when a large volume of the cord grass saltings was lost. Nowadays there there simply might not be enough left to support a large safe moult core area in recent years. 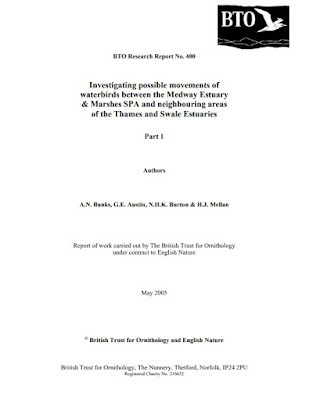 The Medway may well be of importance to the Thames birds. One of Kent's greatest ornithologists, Norman Ticehurst, author of many of the migration outlines in Witherby's Handbook, summed up 'British' movements well 80 years ago. While a fair proportion of Britain's Redshanks remain relatively close to home, more than half move to winter here in the south, or just over the Channel and would be well on their way to, or in, their wintering quarters by September. So, not-so-local Brits, say, from north of the border, might also make the relatively short migration to the south of England, increasing numbers to a peak. Cue the Migration Atlas. The rest of continental Europe is also of our race, the nominate totanus but, within a race can be many populations, doing their own 'thing'. 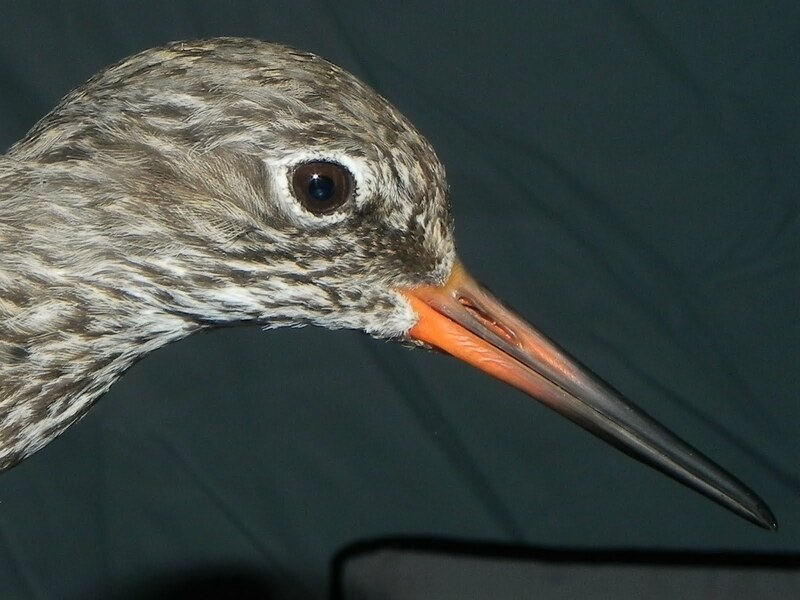 The smallest totanus Redshank, from northern Scandinavia, move the furthest- south into Africa for winter. That population might well be using its own flyway down the Atlantic coast. Another population, say, the Danes, might well just go south overland to the Mediterranean and miss us out. It is complicated. But it is fair to say the nominate, our local Brits and just over the Channel, winter fairly close to home. West-central European birds fan out in winter, in a spread thought to be from the English Channel down to Senegal. Do they come and stay here? Nigh-impossible as it is to tell populations apart, worse for telling races apart. They are even hard to tell in the hand (unless, like many a mad ringer, you are willing to collect piles of biometrics and even then the results might not be definitive, just indicative). The texts suggest most moult on their wintering grounds. At the same time some studies have shown some birds can move while in moult to their moult in sunny Africa. 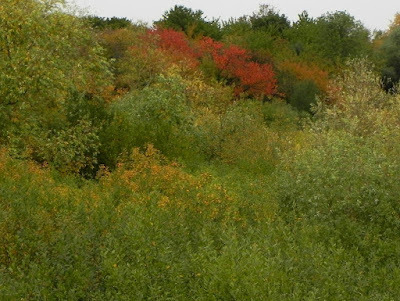 This all adds to the Redshank autumn peak in England, which then drops somewhat at the start of winter. So on the Medway, in autumn, we have residents, staying for the winter. Birds from other parts of the local population, staying. Birds from perhaps several different groups from within mainland Continental populations coming and possibly staying, or coming and possibly going. The largest race, the Icelandic breeders (robusta), winter farthest north, including here around the North Sea. 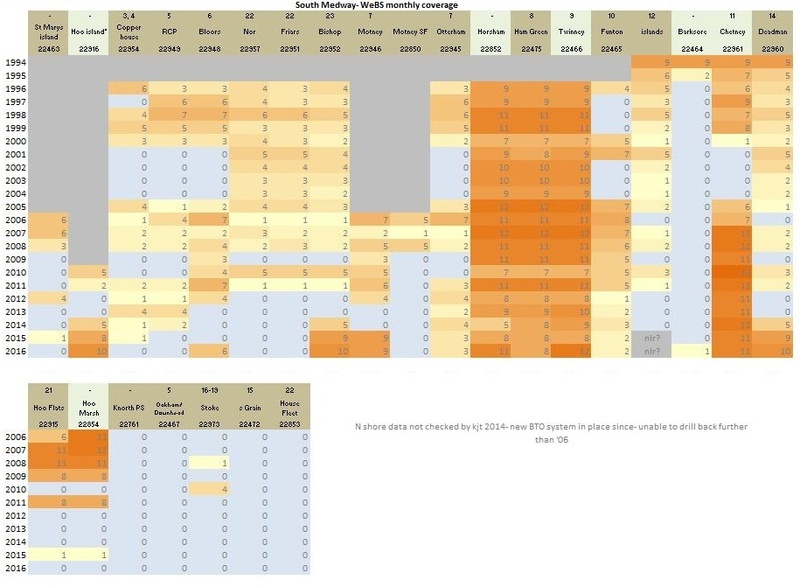 Once again, they are hard to split even in the hand- tonnes of biometrics are needed, including the relatively-recently found to be vital 'toe-tarsus' measurement (yup, if the shoe fits...). The Icelandic robusta finish their moult here in the UK and stay for the winter, keeping total Redshank numbers high. When you look at the Redshanks on the mud, you are looking at an international mix. The Medway plays home to a minimum three recognised races of a minimum four populations of the two races in any autumn through into winter. Phew. Now you might want to try to see them, and the differences in racial appearance might seem fairly easy if you only go by some texts. But best not to. The reason a separate British race was held as valid for some years was because, in the simplest terms, measurements were more like continentals with plumage closer to Icelandic. That was finally seen through. Too much clinality. Though they look the same, take my word, these birds really do have interesting back stories. A few years ago a paper was published that found the north Kent marshes were important for the nominate race, including the smaller near continental birds, and concluded that "Icelandic birds form an insignificant proportion of the population of Redshank to be found in north Kent in autumn". That study centred on the Swale. 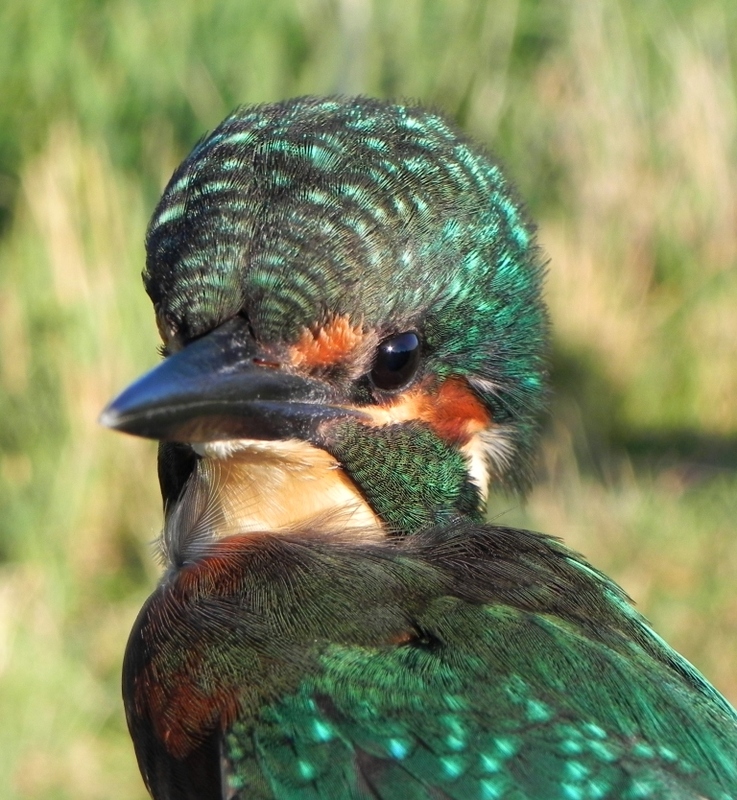 Icelandic birds can and do visit the north Kent marshes, as proven by ringing. There have been recoveries on both the Swale, and the Medway. 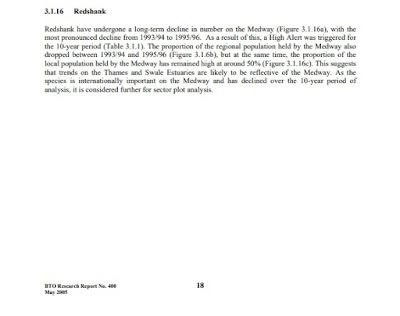 Medway measurements are suggesting a higher than 'insignificant' proportion of Icelandics. The more data you have, the more detailed the findings. 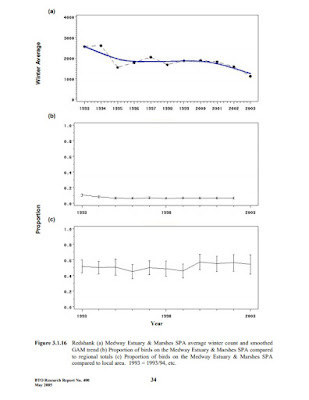 This is not to say that paper's conclusions are wrong for the Swale; it might just be the Swale is better positioned to receive more Continentals on passage. The conclusion that Swale reflected north Kent as a whole might well need refining. It could well be the Medway has the better conditions for moulting birds, and in larger amounts. No need to memorise all this. Just remember whenever anyone tells you we know enough about the birds already, we really don't. 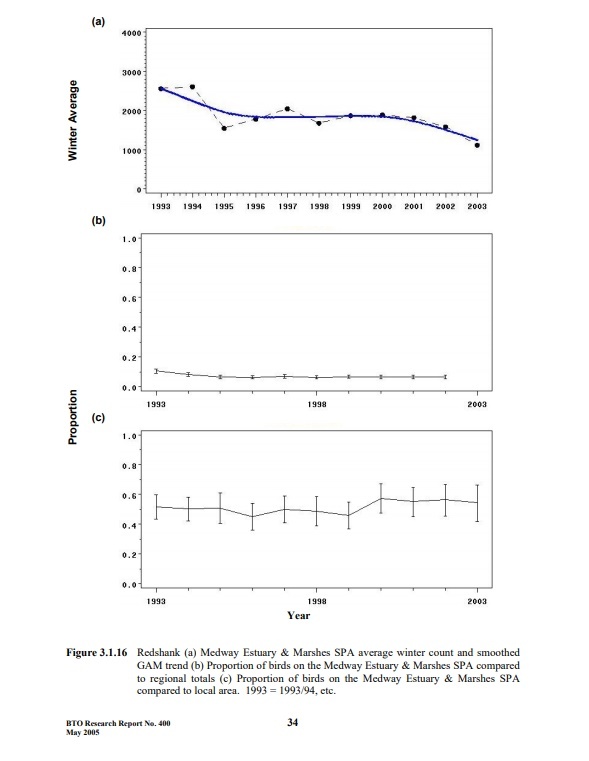 So, when late 80s/early 90s WeBS counts showed an autumn peak somewhat higher than the national average, were they reflecting numbers of continental birds short-stopping to refuel, or even stopping for the primary moult duration? Moving on south, to the Mediterranean basin, leaving a mix of sedentary locals, Icelandics and Contis? Could the fact there was then a massive drop on the Medway and not elsewhere in the south-east be answered by different populations? 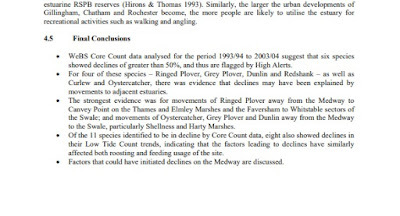 If moult staging, then the 4, 5, 6,000 birds of the early 90's hinted at the Medway being an internationally important site for 4, 5, 6,000 birds needing a safe site for (three months) to change their flight feathers. 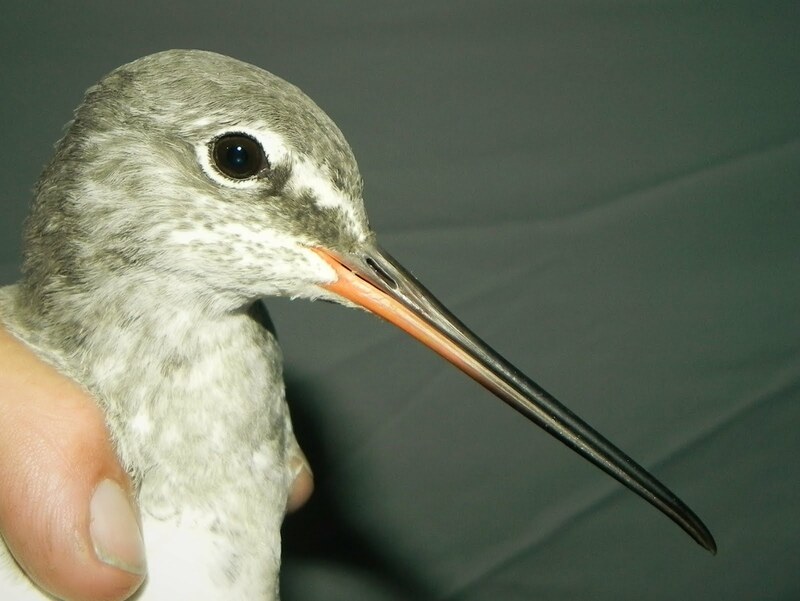 Redshank can, and do, migrate during primary moult. How much extra energy that uses, how this affects length of interim flights, is not known. But it could have been the Medway acted as a vital refuelling site for many more birds as stopover for a few days; 10,000, 20,000 passing through? Who knows? It makes sense to go through the most costly period of moult in a safe spot. The most important thing to now understand is cord grass distribution. Medway has it in spades. Swale has quite a fair bit. 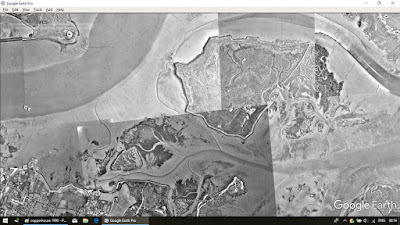 The Thames on the Hoo Peninsula lost nearly all after the sea walls were replaced following the 1953 floods. Redshank love it as a safe roost. Tall enough to hide a leggy wader, not too dense so as to hinder easy movement as the tide progresses. Around the Medway, many preferred roosts are in cord grass. Once fed, large numbers loaf pre-roost close to these sites. And similar numbers are seen most days on each creek- the core areas are indeed small. Looking at the autumn Redshank peak numbers around the north Kent Marshes, the three estuaries have had different patterns. Pre-crash, Medway showed a trend that matched the national trend- a big autumn peak, moulting and transit birds. 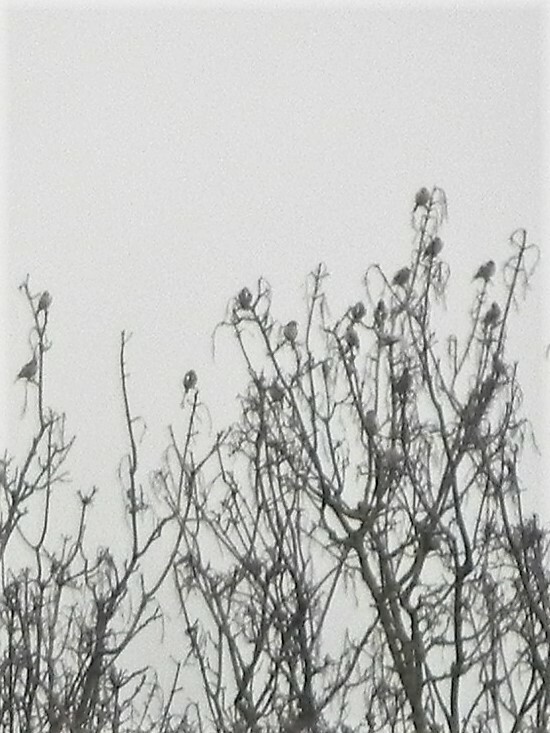 A sizeable wintering population. Post crash, the autumn peak is gone. The Swale? A tad erratic, but, yes, a bit of an early autumn 'bump'. It's been mentioned how some texts hint that many Redshank leave breeding grounds and reach their wintering ground before moulting there. Is there enough 'safe moulting space' on the Swale to hold numbers that might be moulting and staying, moulting and moving on? Perhaps not. The Medway is looking more attractive, habitat wise, for biggest numbers. Or was. Oh Thames, you've never managed to hold a moult population these past few decades, have you? Because you lost most of your cord grass in the 1950s? 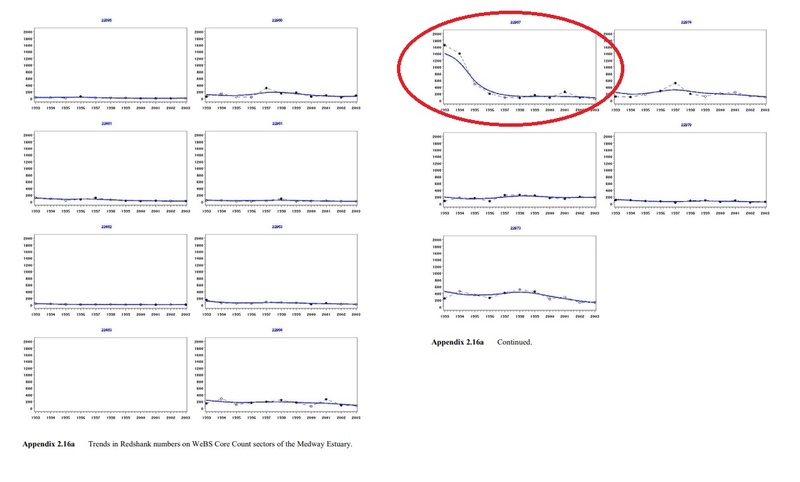 If the drop shown in Medway WeBS counts really reflect reality, the Medway crash is devastating. Constant effort? The 22967 dollar question: was there really a ruddy great fall in numbers? The collapse in numbers sounded alarm bells. Reports were written. 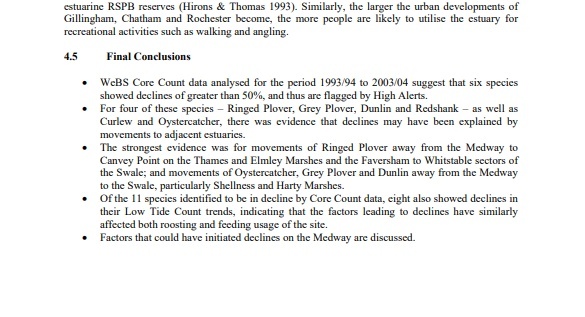 For Redshank, one odd thing stood out- how localised the decline was. On the BTO WeBS pages, it has always been possible for anyone to drill down and find recent count numbers (of actual counts being carried out, not bird totals). The latest upgrades now only allow a ten year drill down, but back when I returned to the Medway in 2012 you could go further. And it made interesting reading. Essentially, from the time of the collapse in numbers, there appeared to have been a similar collapse in coverage effort. Since that time only Funton, Ham Green, Twinney and Chetney have been covered relatively well in most years. The exercise was carried out for the south Medway not long after my move back here. Recently looked at the last ten years of the north shore (as now you can only go back a decade on the BTO website), there has been a similar devastating crash in coverage. 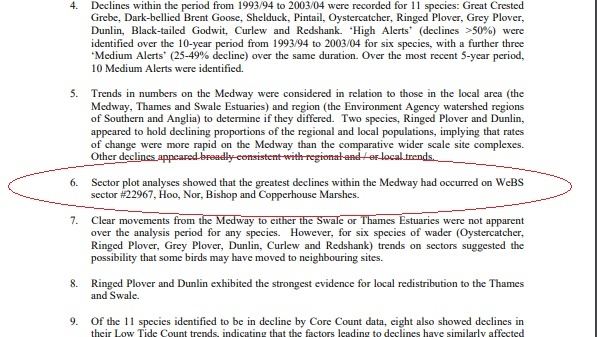 The Medway should be one of the best estuaries in the UK for wader numbers. Anyone glancing at WeBS totals won't appreciate that. It appears that for a long time it has been woefully under-recorded. Under-recorded since about the time of that collapse in fact. I could go on. But for this blogpost, habitat focus will be on one aspect- cord grass. The habitat needed for the highest safe roosting numbers during moult. Has that habitat been wrecked? Has it disappeared in large swathes? 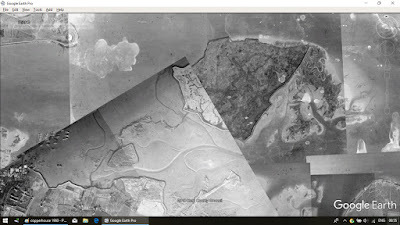 Using Google earth's excellent historic imagery, no, not really. Thank heavens for Google earth. (A fine example of why annual 'fixed position habitat shots' from land can be useful as well.) And of course, this is only one train of thought. 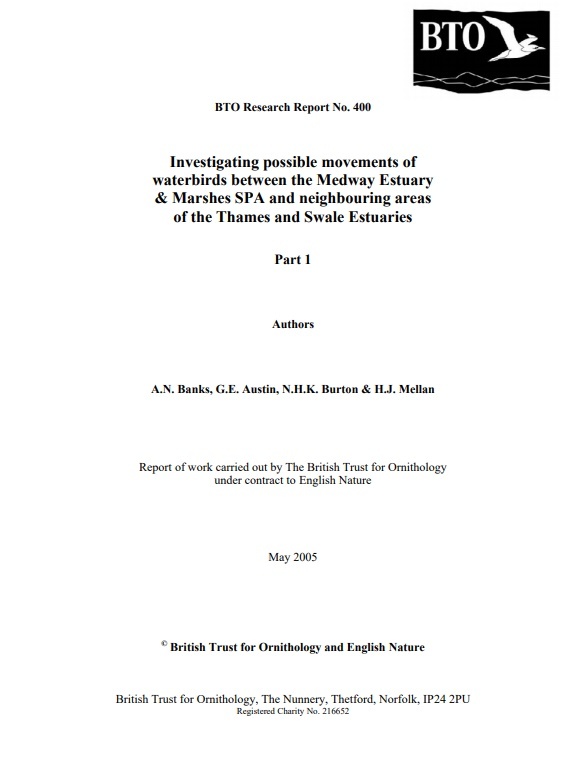 Many others were explored in that extensive BTO report, which is well worth a read. But that drop in counter effort? Was that the cause of the numerical drop in the results? 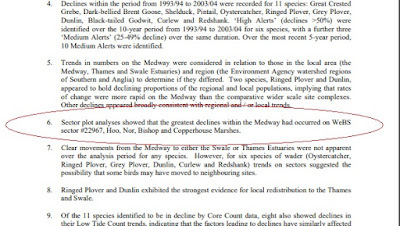 Birdtrends confirms a national decline started around 2001, later than this Medway blip. In the mid-nineties EBCC came in with a population guesstimation of just under 350,000 for the whole of Europe. And in recent years, those numbers are thought to have rallied further. 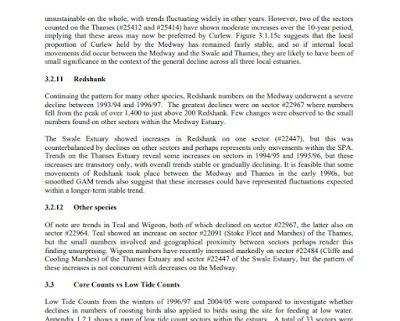 The Medway counts remained low. 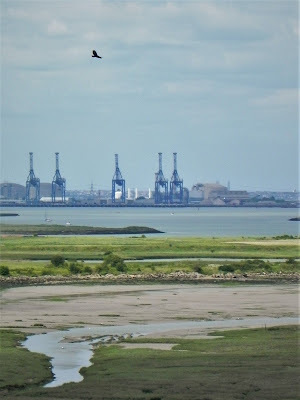 Do birds change creeks around the Medway? 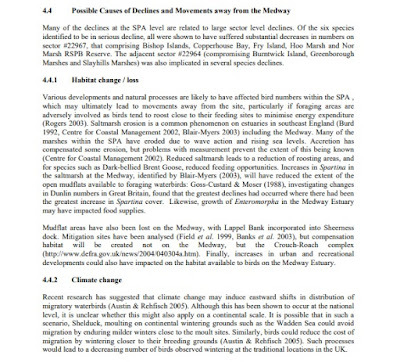 Let's start with that question because it is already known Redshank are loathe to change estuaries. Once a young bird finds their first wintering ground, they to stick with it. They know it, they know their way around it. Cold weather escape flights can happen, but history shows us birds will often try to ride out intense winter weather- and birds will die. But they stay because they know that estuary well. Low tide feeding? They have preferred creeks, but will switch short-term. Weather, disturbance. Some are extremely loathe to leave (especially those that defend a small territory). And if they go, they are back after a day or so. Safe roosting might mean a Redshank's core area includes two, three WeBS count areas. Example- birds from Rainham Docks East can and do cross to Otterham, in ones/twos over the reedbed on the peninsula, usually to carry on feeding. Disturb an early roost at RDE, they will head for Motney or Rainham Saltings. On a spring, to Nor/Friars/Bishop- but they will soon change back to their favourite safe spot. A big disturbance can rock things for a while; late October/ early November many birds switch due to fireworks disturbance (the urge to set off rockets from the sea wall is too much for some). After the autumn moult, individual core area patterns change. During the moult, the core area is kept small. Enough food, save energy- tolerate your fellow 'shanks a little more. Afterwards, being able to respond to threats at peak performance, adults might be prepared to go further to feed, might be prepared to roost more in the open. 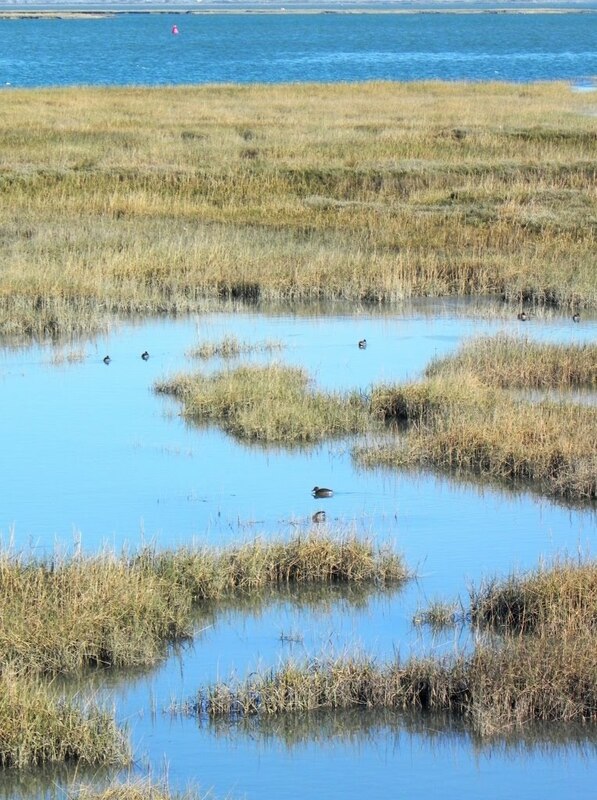 By winter a number of birds are prepared to commute to mid-estuary during the tidal cycle. They might also push youngsters out of their loose assemblies, out towards the less safe areas; better an unproven youngster get taken by a local predator than a proven breeder. This means the end of the moult period is the start of a bit of hike on the detectability scale; small discreet roosts scattered around a salting, more feeding birds out mid-estuary. 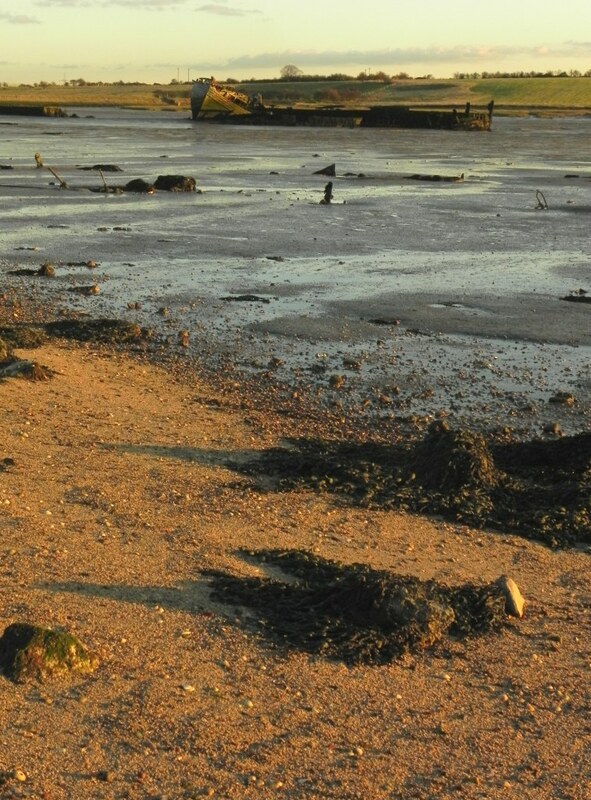 Some spread towards areas little used during the moult, such as the head of the estuary at St. Mary's/Upnor. Much harder to count (just as the WeBS core season starts; the Medway is not usually counted over the summer). So counts go down, but perhaps by more than the number that have actually just moult staged here and moved on. Could it even be that the majority of Redshank do stay on after their moult, a shallower percentage drop more in line with, say, the nearby Swale? More questions to answer. First though, can we find some of the missing birds? In the years prior to my return, peaks had supposedly just been in the low hundreds. Right from the moment of my return in many spots you could beat that number in just one scan of the binoculars at the right time of the tide, if you timed things right. Time it wrong, and there's simply not that many in view. High tide is certainly a wrong time for peaks. And for many years of late only a small part of the estuary has been counted at high tide. Getting out up to three times a day I get to take 70, 80, 90 snapshots a month, at the times of my choosing. Much easier to see trends. WeBS is about one high tide snapshot a month. The answer, for recording peak numbers, is not the WeBS high tide count. The birds are hidden up in the cord grass. It needs supplemental counts. And the WeBS scheme allows, actually encourages, supplemental counts. The best conditions are, roughly, three and a half hours before high tide. Birds are being pushed up the creeks. The last covering by the tide might take around half-an-hour from this time so the optimal count time is outside the official WeBS guidelines (being ideally within two hours either side of high tide, pushing it for three). On a neap, the optimal count time can often be nearer four hours prior to high tide. The answer has to be a supplemental count. The trick for one visit perfection on a count day could be, perhaps, to arrive early and get in a supplemental then. And then have a full WeBS count scheduled for, say, h.t. -2 hours. Tough work, but the more supplemental counts collated, the easier it would be for an analyst to crunch those numbers. Make the most of your WeBS count. Arrive for the 3.0 metre mark (or 2.5 where applicable around here) and get in a quick count, see where they go in to roost, note where they might switch to. Then bash the bushes for half an hour (or go grab a coffee) and come back within the allocated WeBS count time period to get another number. You have a supplemental count, and an official count. Strong data. Heck, do you count with a chum? Perhaps take it turns for the early shift, both do the main? There are all sorts of options- if there is the will. Perhaps the County Society could be encouraged to promote the WeBS count sectors to their members, then their database mirrors and provides additional supplemental counts? All sorts of options. This approach I've been using is what I've termed a 'partly through the tidal cycle count'. Full TTTCs are loved by consultants. 4,5,6, even 10, 11, 12 snapshots taken in one long visit. All sorts of tidal usage picked up. But just two counts of on one day can yield a lot of info. When counters all know each others' areas (photograph the boundaries and share), then even a full coordinated supplemental becomes an easier option by calling on more from within the team. Once tried, you might find you enjoy it. 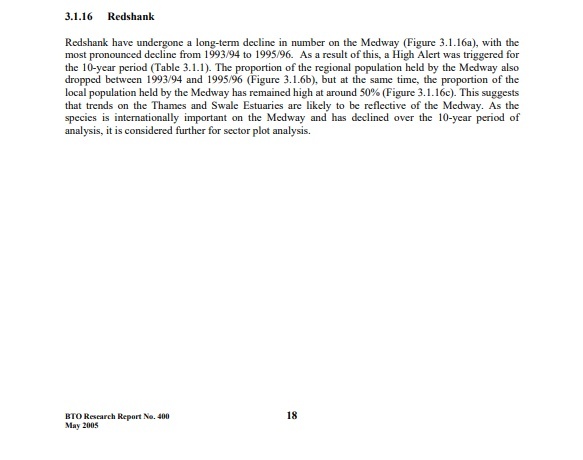 The BTO, Natural England, need robust data. 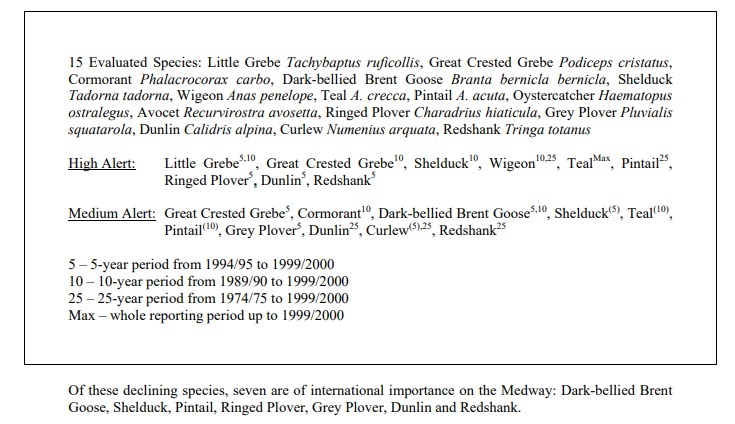 At the moment, for Redshank, existing data might not even be robust enough to qualify as 'grey data'. How can we expect to argue against future developments if the BTO and County Society don't hold data fit for such purpose? If you think I'm saying to local counters 'you're bad at your job', you're wrong. Nearly every counter I've talked with up and down the shoreline these past six years has clearly rightly held a pride in their efforts. This is about being more effective. Understanding the objective. Getting the best result you can. Guidance, logistics, communication, all need to come together. The Medway is Internationally Important. It deserves best effort. Redshanks are cowards. Noisy cowards. 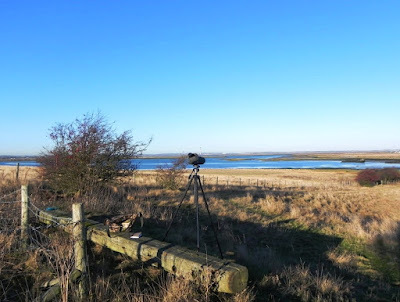 This, to me, is why somewhere like Oare nature reserve works for birders. Waders will tolerate close observation there, even though wildfowlers can and do shoot from the adjacent wall. Simply put, the reserve area has a central point far enough away from the punters so alarmists like Redshanks can (and usually do) roost at their safe distance. 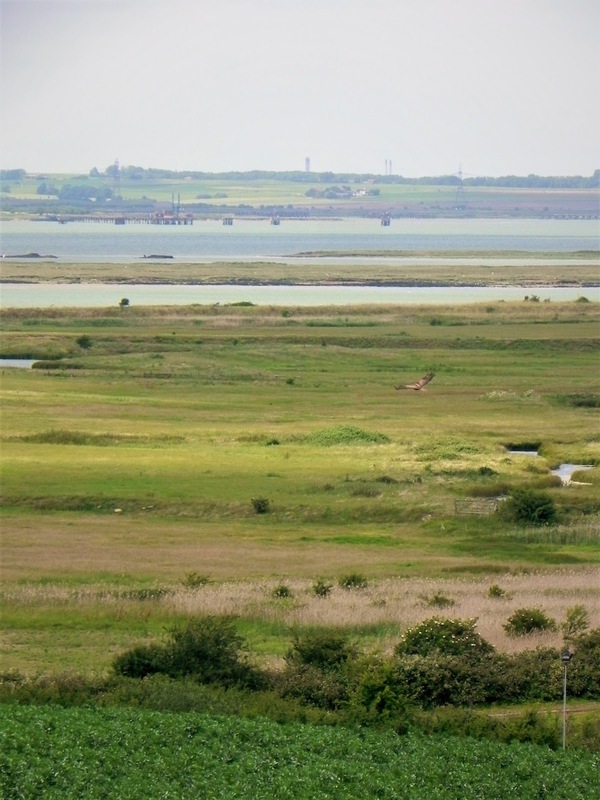 Most of our onshore Medway roosts don't have a protective boundary, and much of the estuary is not yet automatically thought of as a protected conservation zone, but somewhere that acts as a nice backdrop to many a recreational behaviour. Part of why I don't encourage sane birders to the Medway seawall. The best place for large numbers of birders are the reserves, designed to cater for them. I do encourage birders I meet on the seawall. They've made the effort to discover the estuary, the fools(!). 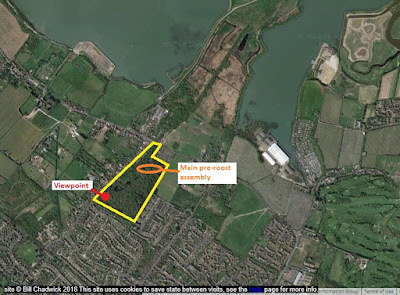 Hopefully they'll be the ones who'll appreciate there is a need to bird this estuary with a high level of fieldcraft. Because our relatively low numbers of birders (in respect of total estuary visitors) have already been shown to cause more disturbance per head than most groups. We increase the number of visiting birders, we increase the volumes of disturbance exponentially. Dog walkers cause the big percentage of disturbance flights, and are a big percentage of estuary visitor numbers; a good place for work of limiting disturbance to start (good luck Birdwise North Kent!) but we birders can start thinking of ways to limit our own disturbance levels. 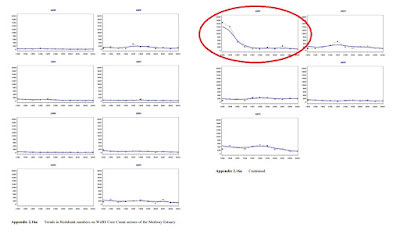 We may choose to disbelieve the figures obtained by consultants, but we should not lose sight of the fact that when questioned, north Kent WeBS counters fed back that the main disturbance was from aircraft, etc. Second? WeBS counters said birdwatchers. Natural England miss the old approach to disturbance monitoring built into WeBS; if they do not get to hear about the problems we encounter, how will they know? 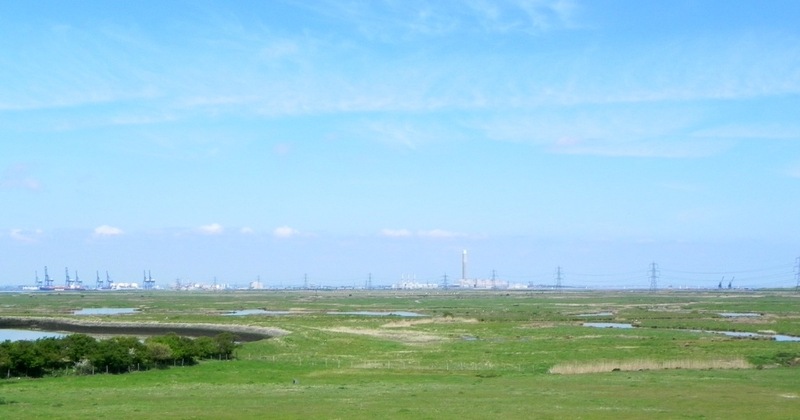 The Redshank will slowly come together from throughout the Rainham 'bay'. 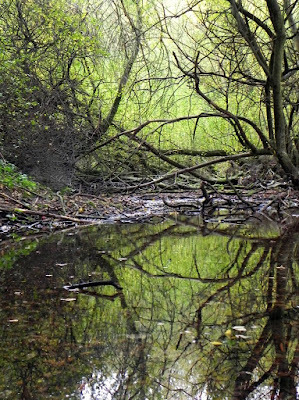 They congeal in the creeks, often out of sight. A bobbing head might give one away, but often you'll miss the half-dozen with it. Not until the creeks have nigh-filled do most stroll out and start thinking about safest roost. Rule of thumb, Redshank feeding/loafing on the western side of Rainham creek head straight for Rainham saltings, to the east, they will probably do the same. 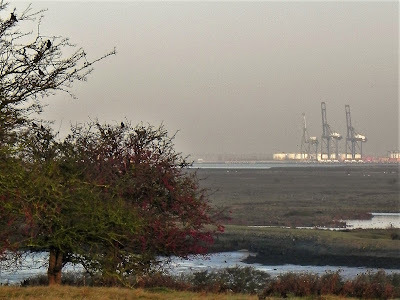 But early morning, few people creating a threat, a fair number might risk Rainham Docks East. Not as much good cover as Rainham saltings, but close to their feeding. If they cannot settle peacefully at RDE, you'll see them flight west to the saltings. 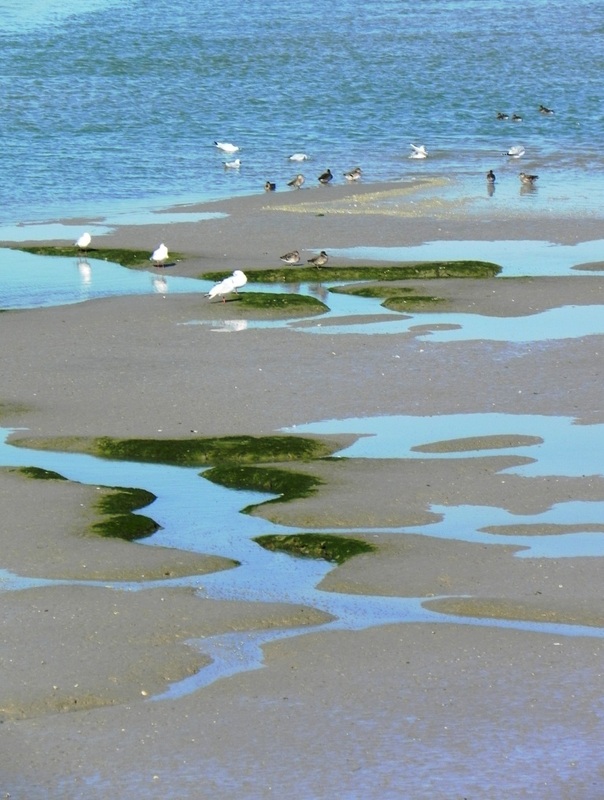 Those saltings hide birds like a poacher's pocket. They'll be hidden in the central channels, they'll roost on the steeper sides, out of the wind, out of sight. Those that miss out on the best spots might end up on the top of the saltings, where we can count them. But you'll need to be there at the top of the tide to see the largest numbers as they emerge from the submerging tideways. They might, just might, ride the tide out there. But they'll often have to use another roost if disturbed, or if the tide is a spring. 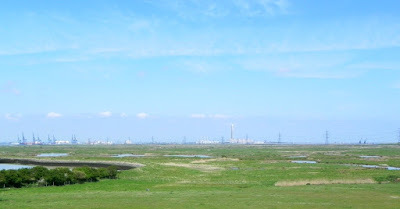 The edges of the RSPB Motney Hill might then come into play, and birds will flight there. It can be a safe spot, but is all too often disturbed. If quiet for a few days (rare) then east Rainham Creek birds might actually make it the choice of roost over Rainham saltings. But doesn't happen that much. And besides, there's a catch. These saltings have few areas that don't flood on a spring. So if the waters push the Redshanks out of Rainham saltings, they don't try Motney. Instead they head for Friars and Nor. And, once again, hide up from shoreline observers. Even from boat-based ones- many head into the large creek just behind the southern wall. You have to get these birds in flight to get a good number. Higher springs, much of Nor goes under, they might then retreat again, to Darnet/Bishop. And if, as is happening more often, storms, surges and rising sea levels put these under pressure the Redshank might try Folly Point or even aerial roost for a short period over the tide. 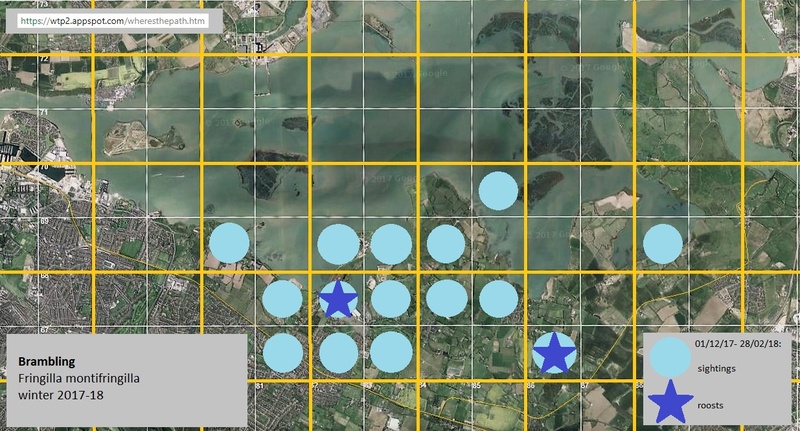 The Rainham Bay complex is, well, complex. 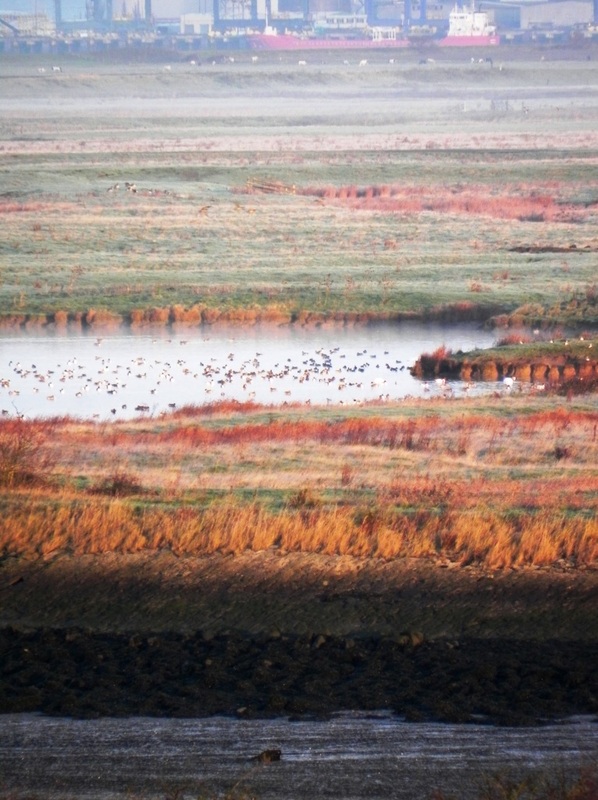 A single bird could easily use three different roost points during one tidal covering period. The same for points west of Horrid, around Copperhouse. Similar for Otterham, though they have a relatively safe inland roost site. The third 'clump' is based around Lower Halstow, preferring Twinney Wharf saltings but all-too often having to flight to the edges of Barksore, or the often watery Millfordhope/Greenborough. Funton birds stay mainly in Funton. If they have to leave, they'll jump the wall to the large fleet on east Barksore. So, the number of the beasties? These are the core groupings. During an average autumn moult period, one day's count conditions might reveal 300, 400, 500 of the Copperhouse roost. You might get a similar number for Rainham Bay. Otterham can give up 200, 300 easily on a good day. Halstow? Under 500 is a poor showing, over 700 a good day. Funton? 300 and you've missed a lot of the show. 400, 500, 600, you've seen a fair proportion. 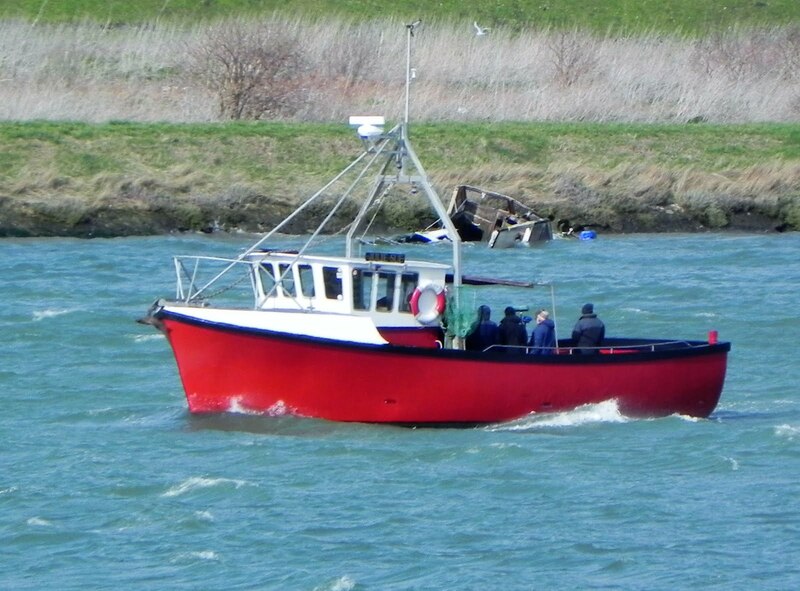 Throw in Queenborough/Rushenden on the 'Swale' which WeBS calls correctly as being Medway, you've got another 300 birds easily countable on an average tide. If you've get a count of, say, 2,400 along the southern shore, you've got a fairly reasonable count. And that's the Internationally Important criteria hit, right there. Heck, if we really are a vital moult/staging area, we should be seeing these numbers. Get timings perfect, you are going to break the Internationally Important criteria. For the southern shore alone. Hoo Flats birds? Oakham? Stoke? Even those Thames' Roas Bank birds that can often move in to roost? Birds further down Long Reach, Horse Reach on the Swale? Will we reach the huge totals seen pre- drop? Well, my gut says no. Because as much as there has been under-counting of late, over-counting has to be considered for back then. If the shoreline counters went, as they did, to get a count on the covering tide, and the boat went out on the high, then double-counting is possible. In recent years, similar things have happened, but the boat has gone out on a different day, on the highest tides. The sort of height when birds might disappear onshore to sites like Barksore and Horsham, or head for the hidden high ground on the north side of Hoo. The boat also goes out during the week, to avoid weekend disturbance. Different factors are driving roost choices. Such adjustments need to be considered before accepting the high counts at face value. 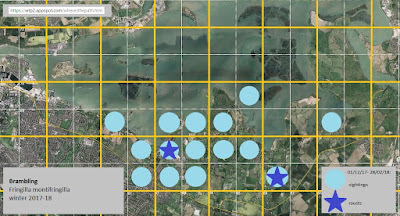 Why the BTO stresses for any large estuary synchronised counts are imperative. I had the chance to call in on the WeBS team up at Thetford a couple of months back, and had a brilliant chat about such matters. This message was the clearest; counts have to be synchronised and the boat needs to be out counting the islands the same time as the shoreline roosts are counted. On the interactive WeBS page, you can pull up a whole series of interesting charts of trends. That high pre-drop autumn peak. Was it really bigger than WeBS 'England' trend? Are we a highly important staging ground for moult? What then happens, do they move on post-moult? The drop off during the winter. Steeper than 'England' trend. A true reflection? Does it mean Medway punches above its weight? 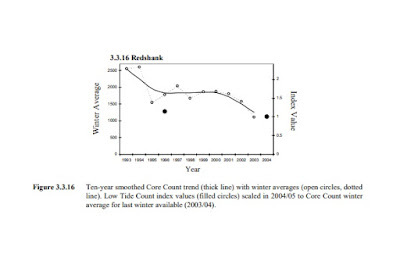 Was it at core carrying capacity, unable to support quite so many birds through the winter? These are just the start of a long list of questions trends raise. 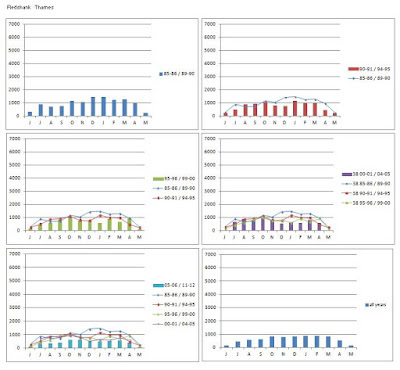 The BTO tried to answer questions raised by the drop, mainly based on the starting premise the data was valid. A worthy starting point, but for it to work, methodologies had to be right. If a layman were just to look at figures for one bay from, say, county databases, many of the snapshots will be away from the optimum count time. It will look as if there really aren't many there. Where a visiting birder hasn't 'connected', they'll hold an image of smaller numbers. The full picture becomes obscured. 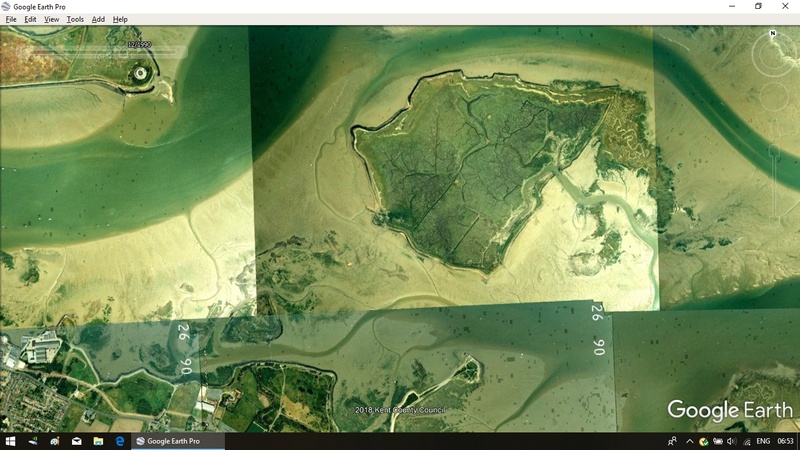 Do the geographical challenges of this estuary make clear 'snapshots' impossible? Counting the islands from shore is tricky. It can be done. Best counters, watching for the whole four hours around the high, could well pick up and identify a large percentage of any roost put up by the tide. How would such an effort pan out against the boat count? There is a need to get sorted one way or another, as quickly as possible. What was the true loss in numbers from the reclamation of the Lappel Bank? We missed a trick there. What will be the knock on from any port extension at Rushenden? From increased shoreline access c/o the imminent Coast Path. Possibly could be missing recording that to the gaps in recent years. Can counters be encouraged to go for year round coverage, as other estuaries do? Or supplemental annual Low Tide Counts, as some do? LTCs are actually extremely easy to manage. Two or three counters could do over a couple of weeks, much as several other large estuaries now do. Can the local Society get right behind correct recording by, say, encouraging members to adopt the core count sections as recognised areas for informal ad hoc counts? Just how many of these species had true declines at the time is a series of similarly long stories, each for another time. For now, the main thing is to recognise how count effort has had a big effect on the snapshots being used for all of these species listed- by ornithological bodies, by developers, everyone. So, the new Local Organisers have set out two initial objectives and are busy selling these to their existing counters, seeking input and agreement- and many more counters! - Achievable, but only partly at present as e.g. some industrial sites may be impossible to access at weekends. Medway full coverage might have to be "90%", leaving these places until such time arrangements change. - an aspiration for '18-'19, as the priority counts have already started for this winter. 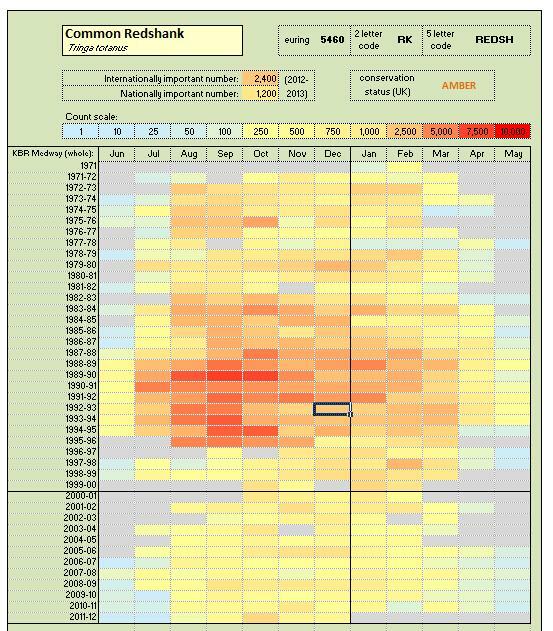 A significant achievement will be a full (90%) count in the most important month this coming season, the month for international returns: January 2019. Additional helpers for the Sunday 20th would be most welcome. - from our planning debates on the Medway, best to target for 2018-19. The boat is booked for this winter. There is time to get counters on board (pun intended) with various ideas (perhaps an additional 'supplemental' full estuary midweek count with boat midweek or attempt a 'full island count from land'). Be open with counters as to opportunities/threats to consider, and see what all feel achievable. 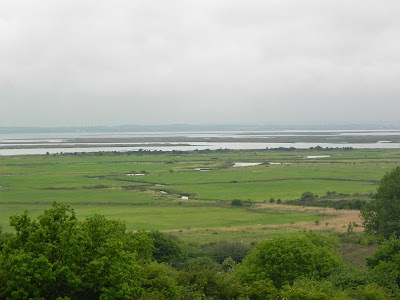 The north Kent marshes deserve full and thorough coverage. 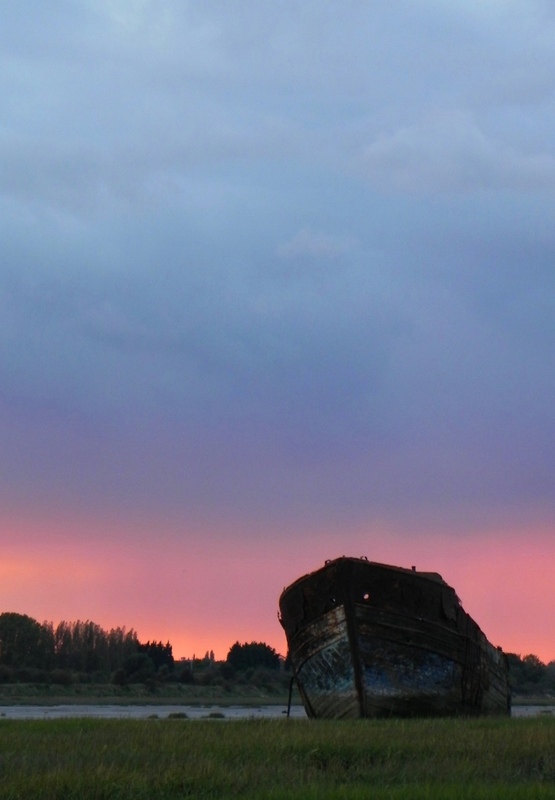 So, good luck to all those involved with the relaunch on the Medway; onwards, and upwards. At a recent meeting with Natural England, I had the chance to mention the planned changes; very much welcomed, very well received. NE wished all involved the very best. I asked for a message I could quote at the relaunch meeting, and was told "..consistency for trends should be the goal, not simply peak counts. 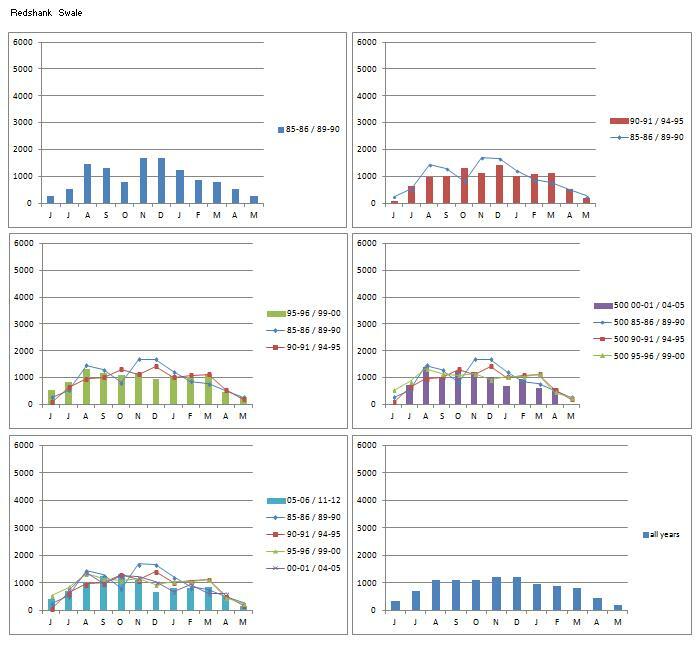 Robust data which enables better monitoring of trends at regional level would be a great asset..."
Bob Knight is the new Local Organiser for the Medway. Please do get in touch, via BTO WeBS pages, if you feel you can help in any way. And we're back. Wonder if anyone'll notice before Christmas? First couple of posts are going to relate to an old matter, and the first really is a bit of a scene setter. You'll see why in the next post. Today we're going to play with some statistics. If you only have a small dataset, then the 'standard error' within that dataset could well be large. In English? A birder who goes once a month to the nearby reserve and says it's his 'local patch' would produce a pretty wobbly write up for common species. If you have a large dataset, then the 'standard error' within that dataset is much more likely to be small. Another birder on the same site, out 300+ days of the year, would have the better grasp on the site. If you only count 'your' site on three dates in three months, then there's a really high chance you will have missed the more meaningful days. But a dozen once a month-ers could combine their data. In the olden days, that was the local grapevine and the Ornithological Society. Now it's taken to higher levels by the stats gurus. A confidence interval is a posh way of saying the correct value is likely to be between 'x' and 'y'. Now 95% is a pretty common CI in statistics. You can hold a pretty good confidence level in it. Three observers count a flock. 2,000, 3,000, 4,000. Can't do too much with that. And just throwing out a number means birders getting antsy about high/low counts and individual birders pee'd that they're not believed. Now if 10 observers had submitted a count (p'raps there was a rare that day), 1,000, 1,750, 1,800, 1,850, 1,875, 1,900, 2,000, 2,125, 2,140, 4,000. You can start to have some confidence the actual flock size is somewhere between 1,750-2,140. And work towards publishing a meaningful figure in the annual report. The magic tricks used by Statisticians aren't really tricks; within their framework they mirror common sense reality. There's a whole field, a flavour of the month right now, called Bayesian Statistics, that works this way with probabilities. Like a stage magician's audience, us mere mortals can but marvel at how the results they produce are somehow 'right'. True magic! But they still need raw data. What I've been musing on is how they cope when a dataset is small. So you've got a small dataset. Say just a hundred entries. You find your standard errors and confidence intervals, but you still don't trust them- they might be weak, but you can't go out and collect any more data. Simples! Do the magic trick over and over. Just re-use your original data, over and over again. Witchcraft?! It certainly is- one method, despite many in the audience doubting, that works. Okay, the forgettable bit. If you really wanted to, how do you bootstrap? You only have a 100 pieces of data. 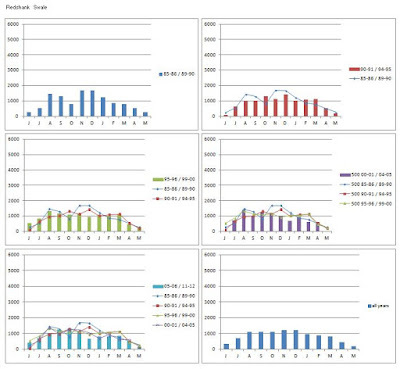 Print out all your data on little individual slips, and put all 100 in a bag. Draw one out, and write it down. That's your new data. Put it back in the bag. Draw again, from all 100 individual slips. You now have two new pieces of data to work with. And repeat until you have thousands and thousands and thousands of new pieces of data.. Anyone with a stats O level or similar, please don't sue me. I'm fick and this is an imprecise guide. I only want the average birder to have a rough idea of how and why their BBSs, Birdtracks, WeBS, get played with. We often think the figures we've provided do the hard work. Well, without them the magic couldn't happen. But the magic has to happen. The reason I'm saying all this? To explain when the stat wizards say the results of one methodology are compatible to another, they've probably used wizardry like bootstrapping. There are ways and means to compare results gained from one methodology against results from another. 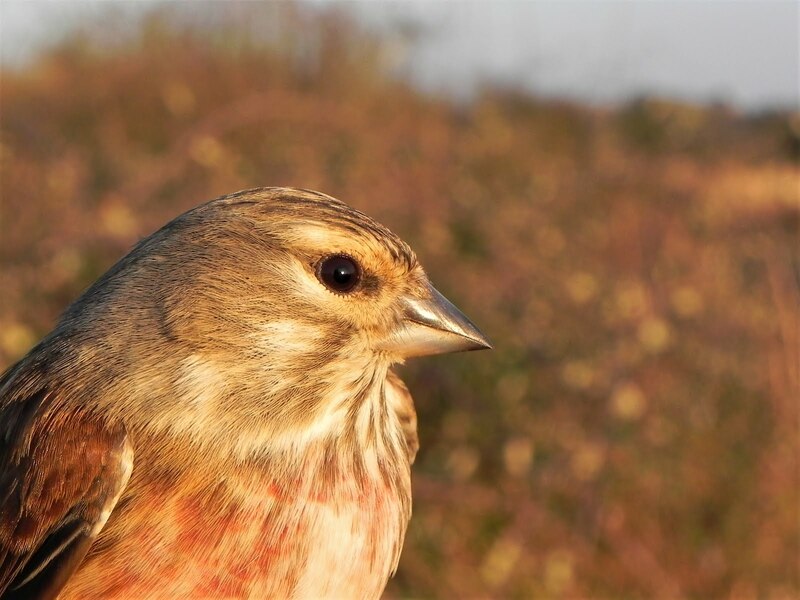 A bird survey that needs only three visits has been compared to a daily survey, and shown to have, once tinkered with, results are are comparable to another. Of course, neither might be actually precise! If the confidence levels overlap, we're getting there. 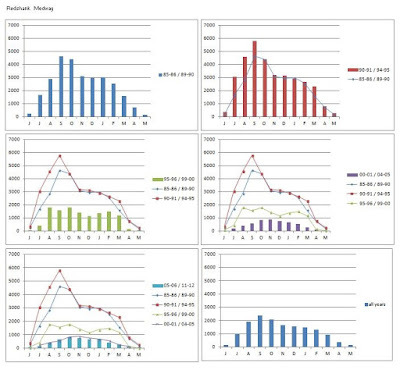 For a practical survey methodology the statisticians cut data collection to the bare, it ensure it is robust enough to produce a result comparable to the actual. Win win. The observer, the citizen scientist, has a figure they have absolute faith in. They will tell you there were 4,000 of 'x' last week absolute certainty. And they're happy. Of course, they could still be well out. It doesn't really matter when the stat wizards might well receive 999 different figures from 999 observers that they can play with.. Win win. Observer happy, statisticians happy. All the worrying about whether there's 500, 700, 900 present. Doesn't really matter. No, they just guide us by giving us, well, guidelines. In your BBS, trying not going out with a team of 3 or 4 counters- better if all the counters have just one set of eyes. In your Garden Birdwatch, sticking to the time limits. On WeBS, coordinating counts. They're guidelines. They know we're human and some go out with a mate, some will go way beyond the time limits to get the extra species and some will count on the covering tide on a weekday, rather than high at the weekend, because that's when the most birds are there. And it's why you should never cheat. 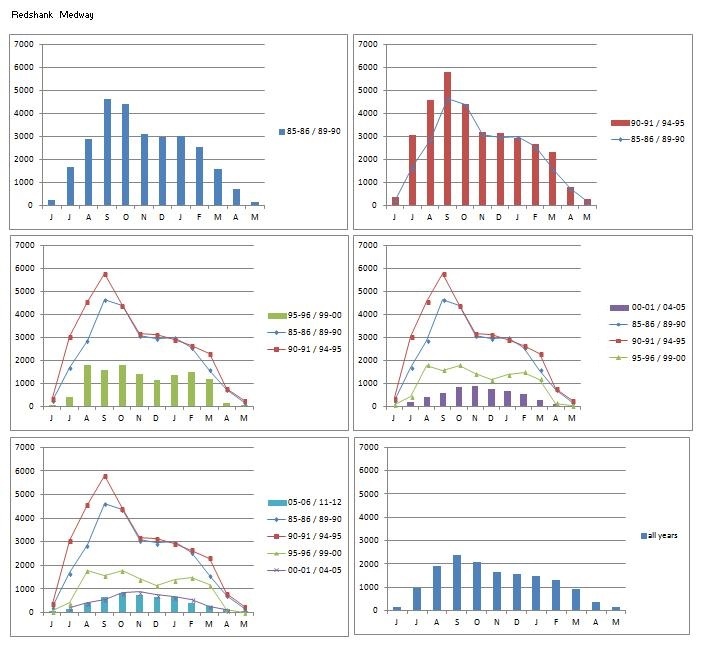 I knew one site where one excellent birder was out every day, and got some great peak monthly counts. And then that area's WeBS counter went through the birder's figure (without their permission/knowledge) and instead claimed every peak monthly count as the number seen on WeBS day. Done with best intent, but hyper-inflating the site's value against others. If a national survey, they are looking for national comparables. You're not doing it to get 'high counts'. Regional trends can be pulled out by a statistician once they play with confidences, once they vet the data to remove those who admit to relaxing the guidelines. Locally though, they might not have enough confidence in your dataset to pull out a meaningful result. Why they appeal for as many records as possible. Now, you're probably wondering why I've rambled on. Well, what if you have different surveys running in tandem? Comparability and compatibility. That's the background for the next blogpost. Second half of April I gambled, and won. I had worried I wouldn't turn up any Brambling on my final Magpie roost count for the 2017-18 season, but about ten minutes before sunset a small group bounded into view. That view was through the 'scope, naturally; distant white rumps flashing among the branches and, unlike in true 'winter mode', when they would sit for long periods up in the tops to act as attractants to others, this late in the season, pre-migration, it was once around the block then down into cover. And that's the birdy news over for this post. You can leave now if you want. The blog post is more about Berengrave LNR itself, and changes since the boardwalk closed. Imagine the quarry paths as a (very rough) triangle. 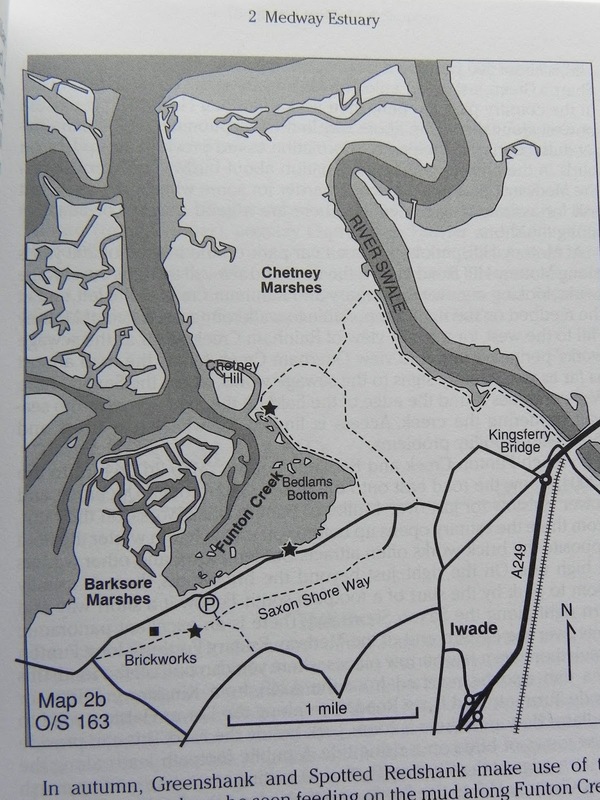 In the good old days (when I moved back in 2013), coming in from the estuary, you had two routes down either side to choose from to reach the third southern edge. To the west, an undulating walk along the quarry edge, with very few views down into the pit. 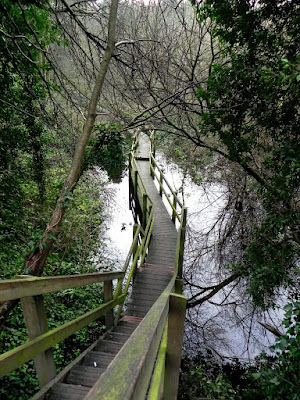 To the east, a wonderful roller coaster of a boardwalk, rising and falling into the quarry depths until a final steep climb out of what one birder described as the nearest thing on planet earth to Dagobah. Colour me green and call me Yoda. Easy to guess which way I always chose. In those days, the boardwalk was in good condition, but time was running out. The construction and repair work had, over the years, been carried out mainly by a support group, the Friends of Berengrave. 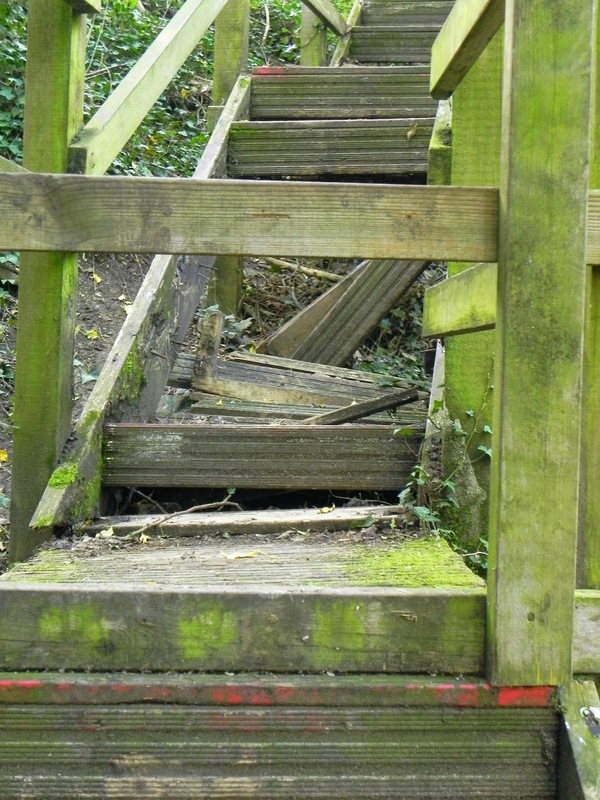 Long story short, politics crept in and the rot set in; repairs were not allowed and the boardwalk was eventually closed off to the public by the Council. What this meant was that any circular route around the reserve was no longer available. The number of visitors plummeted. Thankfully I could still get to my Magpie count spot and while I couldn't explore as much as in the past I was now keen to see what happened with the birds. Ever since the Foot and Mouth outbreak in 2001 and the 'closure of the countryside' I'd supported what was found by many back then; you stop the public from wandering the countryside and birds do better. So, first thought had been 'this is going to be good'. 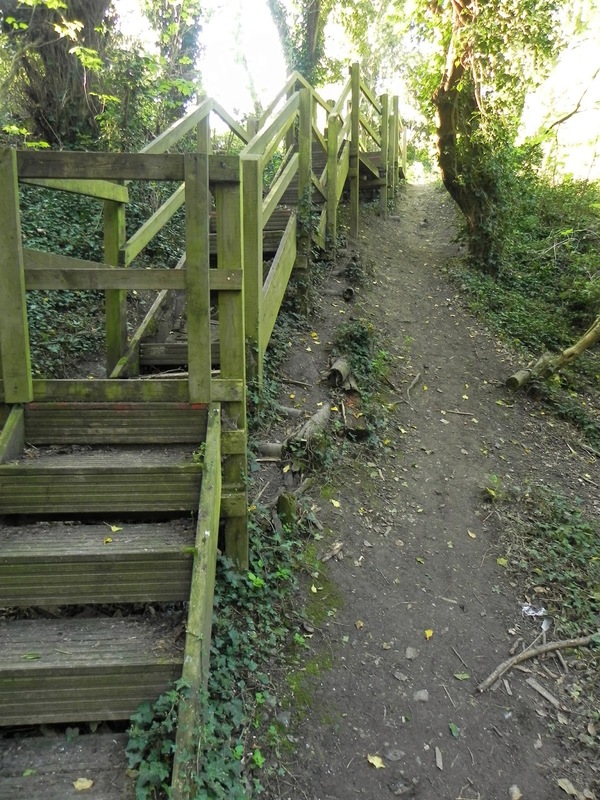 The main users of this tiny local nature reserve were recreational dog walkers. A known disturbance. 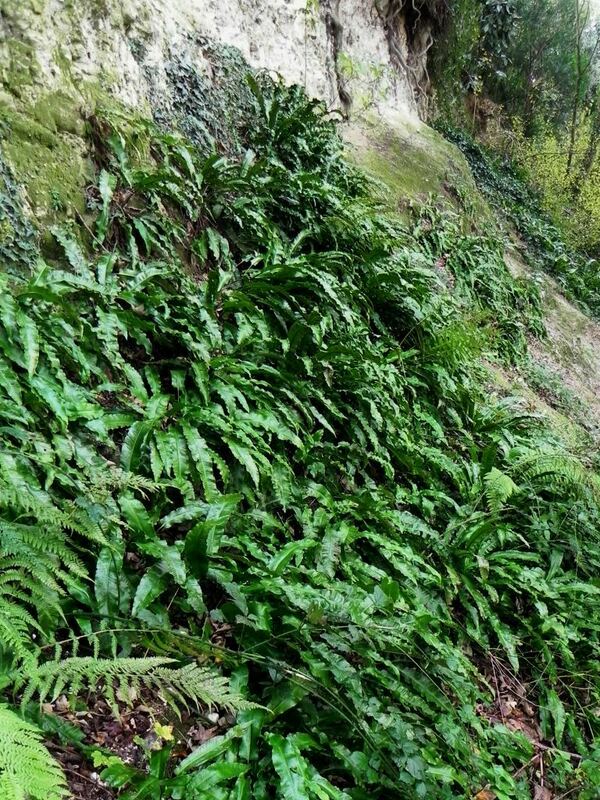 Here though, dogs had always been mainly on leads (there are some steep drops around the quarry), so not as much uncontrolled disturbance as elsewhere. Noise disturbance? Sure the odd yappy (and by that I mean the shouty owner), but usually fairly quiet. The main effect noticed in the past had been flighting. A noisy visitor would put up early roosters, with Woodpigeon and Magpie the most noticeable. 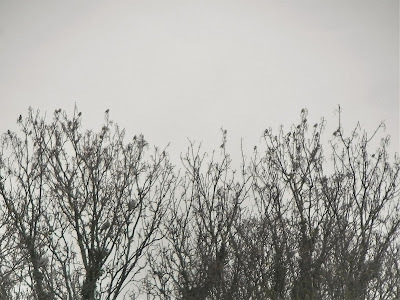 About two thirds of the time, they would circle and resettle, otherwise they would move off, normally towards cover nearby (beyond the Berengrave Nurseries and towards the Bloors Community Woodland). The Magpies would then often work back, the Woodpigeon not so much. Harder to note the effects on smaller passerines, but small groups of finches would put up, and again, some species more prone to leaving Berengrave and not returning that evening; Goldfinches often appeared the most reluctant to stay, and they never roosted deep in the quarry anyway, preferring the edgelands; roost quality obviously played a part in any flight decision. There were sometimes noisier human visitors of course. The reserve appealed to the younger element. 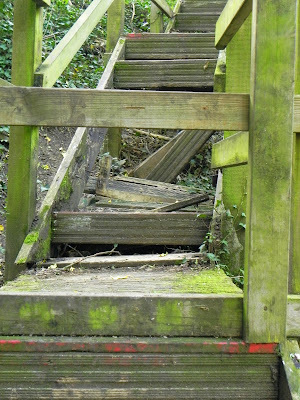 The rising boardwalk was a good climbing frame, the paths, despite the no cycling signs, a nice little off-road workout. I think during those first few years I met fewer than a dozen naturalists. And that would have been one botanist and eleven birders- we were never great users. A hard to work site, with minimal facilities? Birders were always likely to amble elsewhere. Following the boardwalk closure local dog walkers still take the eastern route to and from the main Country Park, but in much smaller numbers. Many dogs don't get long walks in Medway. Fewer still dog walkers bother with the dead end of a southern edge now it leads nowhere. During the 90 minutes of a count I see less than a quarter of the number of park walkers I had before. This southern edge is where my viewpoint is and it is certainly true contacts are up. Though for most common species my roost numbers are fairly similar, birds seem more likely to loiter along this top edge rather than hurry down in. Fewer adventurous youth now as well. The boardwalk still does appeal though, being a big ol' scary climbing frame now. But the routine flushings of the pre-roost gatherings of Magpies and Woodpigeons are a thing of the past now. All in all, I'd say the birds are enjoying the lower disturbance levels. But there has been a growth in another area of human activity. Fewer recreational public, more recreational drug users. Good and bad birders. Good and bad dog walkers. Good and bad potheads. The nice ones are really pleasant. They come to sit on one of the three benches along the southern edge, smoke their weed, take in the view and chill out. And they're pretty chilled about me if I turn up at the first bench to count. I explain what I'm about, and they go 'whoooah', have a look through the 'scope and then wander off to one of the other benches. I'm sure one of their number was behind the 'save the bees' graffiti that appeared on the barrier. Good 'uns usually arrive in pairs. Stumble in upon a hazy cloud made up of more than half-a-dozen, and you know to tread carefully. Usually no more than a bit of verbal if you set up shop, normally never more than a loud verbal, especially if they're at the second bench just about five metres away. I just think of the abuse being rather like adolescent chimps flinging faeces. Same old sh*t we've all had to put up with over the years. And they never actually threaten actual violence. T'was ever so. But you know on the evenings you don't show, they're the ones setting the small fires, breaking the barriers. Throwing their beer cans down the bank. T'was ever so. The third bench, the far bench? Well, that's another few hundred metres on, and only the most adventurous dog walkers venture that far. You have to want to be going there. So this spot appeals to those who like tablets a little stronger, the ones that come in teeny plastic bags with cheery little logos printed on them. 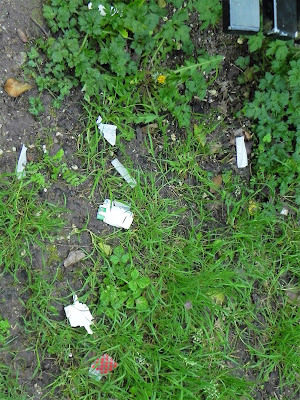 What the heck do the owners, the local council, do with an 'asset' like Berengrave? 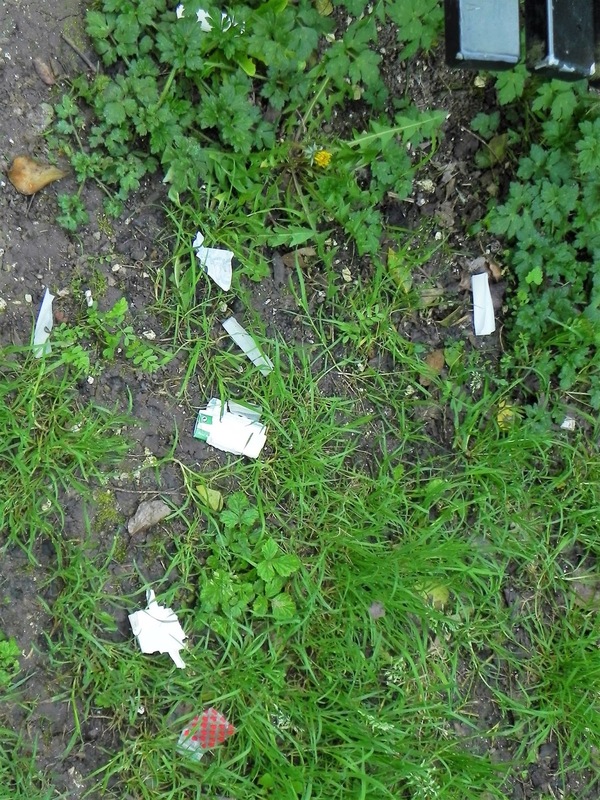 We nature lovers don't show the love enough enough, yet we expect our Councils to uphold our LNRs. Should they spend loads on replacing the boardwalk when it is so little used? Should they pull it down as it is no longer fit for purpose? Or do they close off all access as they did for a short time prior to my move back? Never mind the human politics, what would the birds say? Well, it is one of the few overgrown areas left locally. Roosts opportunities abound. For common 'town' species, the noisy humans never really had an effect on numbers in the past, and neither have their roosting numbers increased since it has become quieter. Too soon to say if the more 'sensitive' species have increased. Their numbers, like these Brambling I've watched this past winter, are up and down for other reasons. A lot of these species are usually the last into roost anyway, chances are they've always missed the noisier people by dropping in at last light. 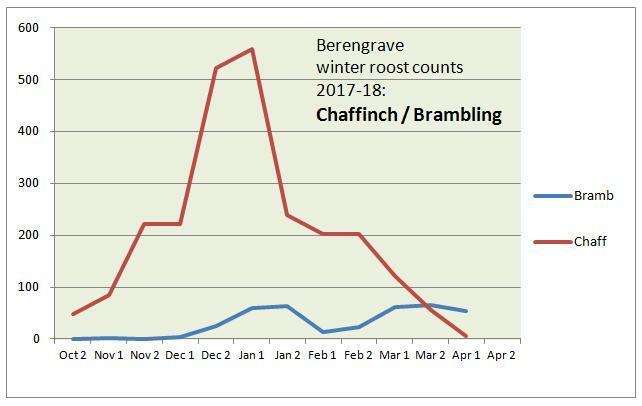 Of course, summer and breeding are a whole different study but Berengrave remains a safe winter haven. Long may it stay so. With the amount of housing going up close by, the importance grows. Me, personally? Well, I hope they never feel the need to completely close off again because of purely selfish reasons; I've loved my five winters of Magpie roost counting. Who would want to be a Council employee/ Councillor responsible for making best decisions for all users of a site like this? There's a price to pay for hanging on to sites like these, one that fewer birders seem willing to pay. We don't shop for our sightings at the Mom'n'Pop old style sites. We don't even go and browse at the out-of-town birding megastores so much. We browse the internet for good stuff, and buy in to what we're told are the must-haves this season. Me? I've just resolved to make a few more visits than usual this breeding season, before the 'everything must go' signs appear..
For more information on this LNR do check out the now sadly dormant 'Friends of Berengrave' website. Sections of the boardwalk are closed off by simple planks..
..the adventurous just climb beside them..
..viewpoint barriers tend to disappear during school hols.. The morning had started out as a Shelduck chase. Following a few twitter exchanges about the territories they use (which is a blog in itself) I decided a good morning to count some of the non-breeding flocks in the eastern basin. Working back from the Swale station, I soon found myself up on Raspberry hill. 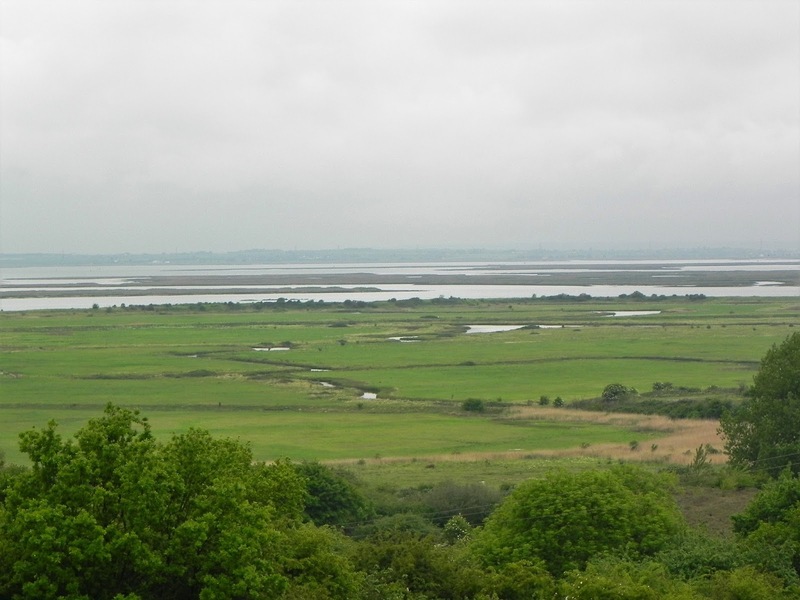 Here, and Tiptree hill have long been known as the best viewpoints for the estuary islands by both birders and non-birders alike. 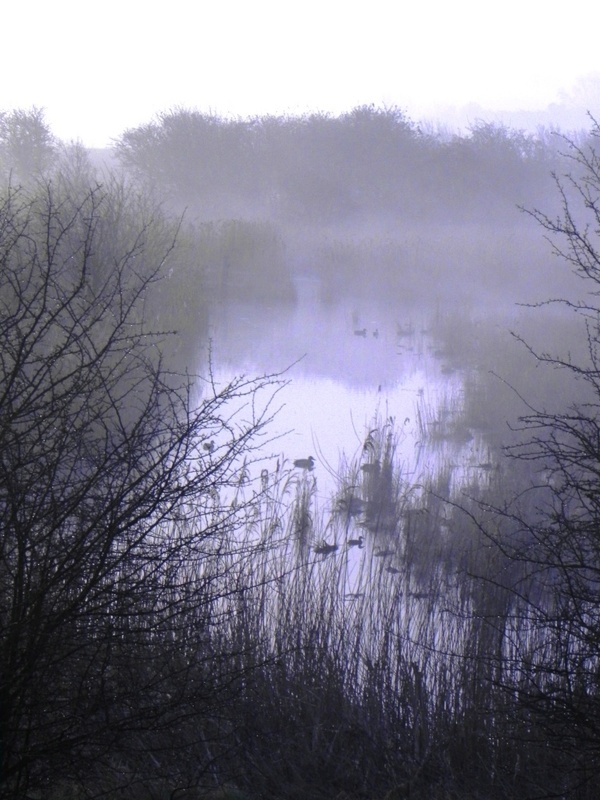 In Helm's 'Where to watch birds in Kent, Surrey and Sussex', Don Taylor had long sung the praises of the viewpoints for 'scoping the distant creeks. They provide some of the best birding on the estuary (probably why I chose Chetney for my first blogpost here). Both viewpoints even have seats of sorts nowadays; the owners have put in a superb huge beam of a bench up on Raspberry hill, while broken chunks of concrete from one of the old wartime buildings have been piled up around the base of the telegraph pole on Tiptree. This is the busier of the two viewpoints, as the path here is one of the highest points of the Saxon Shore Way long distance footpath, although I am usually joined by walkers rather than birders. With my caveat that general birding remains much better on reserves, I've promoted both often enough in the past, but the distant birds views only appeal to obsessive birders (with my cakky old Bridge camera I never get a decent image, but they're fine for record shots of flock sizes, behaviour, etc., besides, heat haze for both 'scope and camera can be a pig). Walking from either Lower Halstow or Iwade appeals to few (leaving a vehicle anywhere at Funton can be problematic; break-ins are, sadly, routine). But they are worth the effort. While I've tweeted and blogged plenty of pics from up there these past five years, another reason I haven't banged on about them these past couple of years because of the ongoing Coast Path discussions. Some stretches of new footpath are likely to arrive in the area, and during this time I'd been asked for information, mainly concerning on both roosts and general disturbance levels. 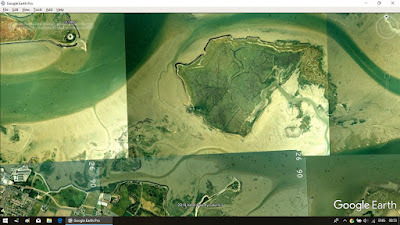 Just a couple of months back I was contacted about one roost near here, when I heard that publication of the route through the estuary is looking likely to be in September (which will raise a few blogposts at that time). So, we're getting close enough not to have to worry about any impact from publicising the viewpoints to birders a little more on here (heck, the other month I was even tweeting the county Recorder saying it'd be worth while getting up and having a scan over Chetney). To date I've only published the first part of the shoreline site guide for the same reason; the remaining sections will come online shortly. Rather than take footpath along the ridge I followed the road west down to Bedlam's Bottom and then along to Funton Creek. I was soon distracted by Rooks. They were feeding manically among the saltings and cord-grass beds. I cursed myself- another pet subject was playing out, and I had nearly missed it. The mini-heatwave we had just enjoyed meant the ground surface was solid in many fields nearby, making difficult feeding for corvids. You can often see three figure counts of Crows on the flats during the year, they have adapted to estuary feeding, but Rooks (and, to a lesser extent, Jackdaws) only join them in big numbers when feeding is tough. Only the day before I'd been impressed by how much like concrete my allotment beds had already become, but I hadn't sussed it was Rook time. Nearly a Rookie mistake. Some local landowners control corvids, just as some North Kent nature reserves do. You can have a big debate on the merits of that, but what interests me is why some landowners spare Rooks, others cull. The texts are clear; Rooks will take both game bird eggs and wader eggs. But to what extent? 'Birds of the Western Palearctic' states the young are fed almost exclusively on insects, but that these are hard to obtain when fields are dry. So, perfect conditions for looking at a question I'd been interested in for years. I took the bridlepath up Tiptree. I went to count my Shelduck flocks first, and found they were nearly all missing (explaining in part the raised Chetney numbers). Then I noticed the local Lapwings were agitated. Not just territorial interaction going on, but real agitation, birds even gathering in a 'mini-flock' sitting out in the middle of one of the pasture fields. Others were flight-distracting. These behaviour continued during all the time I was up there, and it was not going unnoticed by others; numbers of Rooks, as well as Crows, were coming off of the saltings and into the fields. Now the land below Tiptree is no nature reserve. The land is worked, and workers are often out and about. But I then saw someone strolling slowly down the central counter wall and wandering through the centre of the small peninsula below me. Paperwork and behaviour gave away as a bird surveyor, and clearly noting the Lapwings. All probably why the methodology states a telescope is the essential piece of kit for Lapwing surveys. This surveyor was diligently noting each bird that overflew them, or that they picked up in their binoculars. They just didn't appear to be noting what was happening behind them. From nearly a kilometre and a half off. I just had to sit and watch it happen. 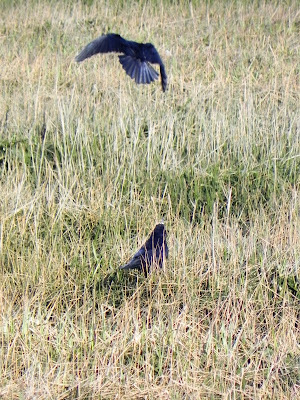 Easy for Lapwings to keep one or two Crows away, much harder to target a couple of dozen Crows among a hundred Rooks. And corvids are just as good as us at mapping out territories. They were watching. That person could well try to justify, and you can justify any action. Justifications hold more weight when countering criticism, but the feedback was pure. In this instance the Lapwings were clearly disturbed, known predators were clearly gathering and published methodologies were not being employed. Why it is best to try to appreciate why the RSPB's Bird Monitoring Methods ask you to do certain things, and then apply. 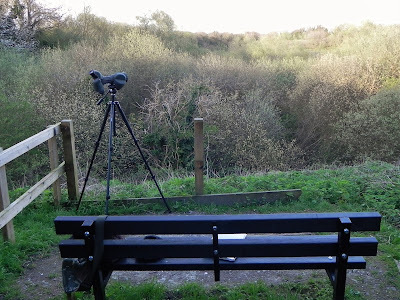 Especially if in plain sight of any observer who happens to be up on what is acknowledged as one of the county's premier birding viewpoints, on one of the county's busier footpaths. Without fieldcraft, you will be seen. And local birders are already on the lookout for problems. A couple of years back, after discussions with RSPB Investigations, I highlighted the plight of our gull colonies; reports of unauthorised landings were on the rise, and some satellite colonies within the island complex had deserted, some witnesses allegeding watching a gang of egg thieves out on the islands (taking the eggs for either for the restaurant trade, or for selling locally, private or otherwise. Sadly, with so much wildlife crime still happening, priorities have to be made and gull colonies come lower than birds of prey. So it has to be local birders who 'recognise, record, report' (the tagline of BAWC). The county ornithological society even kindly published some links to my pleas in here and in other county birding facebook pages. As it is coming up for that time of year again, here's the link to my original 2016 appeal. Of course, viewpoints out to these colonies are Godsends. 'Scopes and cameras necessary tools. I'm told by some there are mobile phones with better cameras than I own. Don't doubt it (but still don't ever want to own a mobile). 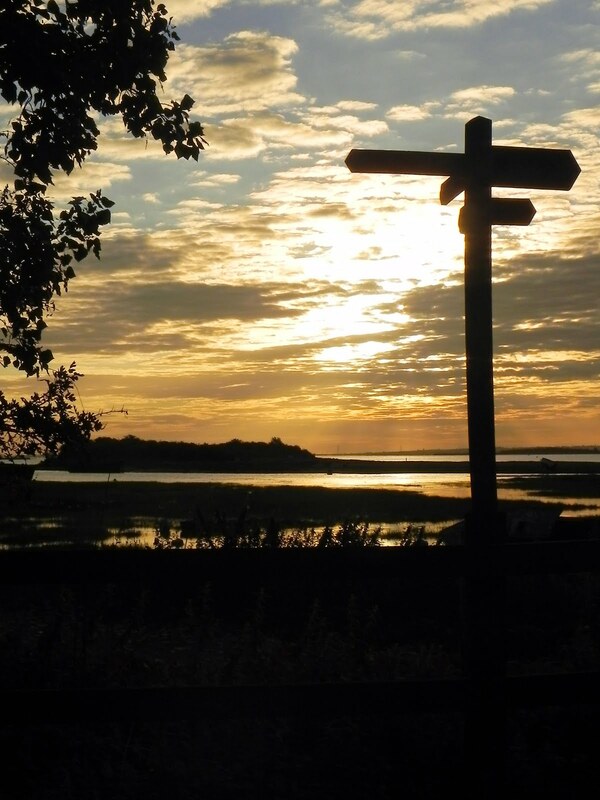 No-one should be naive enough to think they aren't able to be viewed on the marshes, and their actions, whether disturbance or criminal, recognised, recorded and reported. I know I'm often photographed or filmed by some landowners, and I'm more than happy with that. We birders are being asked to set high standards to the general public when alongside our SPAs nowadays, as legally required initiatives to reduce disturbance, such as Birdwise, come into play. Studies have already proven birders to be one of the main disturbances to wintering wildfowl and waders. Often inadvertently, but disturbance all the same. Birders' egos bruise easily when called out on such things, but it really is time to put such sensitivities aside and for us all, birders and birdwatchers, professionals and 'citizen scientists', to acknowledge such feedback and keep raising standards in the field- because we know additional big pressures on our estuaries are coming, and we need to get the public, not just ourselves, 'birdwise'. 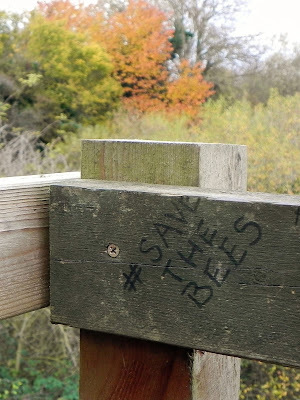 Finally, whether we like it or not, pics of poor birding behaviour appear nigh daily in our birding timelines, often with calls for outright 'naming and shaming'. My harsh tweet that day was deliberately general in details, and non-illustrated. The chair of the county's Conservation and Surveys Committee did reply pretty quickly asking for details, so I did provide clues needed by giving him enough to work out details and appreciate problem (which he did, even though I'd ensured the cropped pic I'd attached for positioning the incident had a nice anonymising blob added over much of the highly pixellated person). Being on the receiving end of feedback can be painful, but we all have to face up to it from time to time. If we don't want to face up to it, we fall back on logical fallacies; appeal to emotion, claim false cause, personal incredulity or 'the strawman'. Or we can take on board, and improve. And that 'we' is why I've posted this; if a few birders think more about such things, then worth it. A final thought. I normally veer away talking about Schedule one birds during the breeding season, but as the county's rep on the Rare Breeding Bird Panel recently talked about the estuary in an open Facebook group, I'll make the following point. 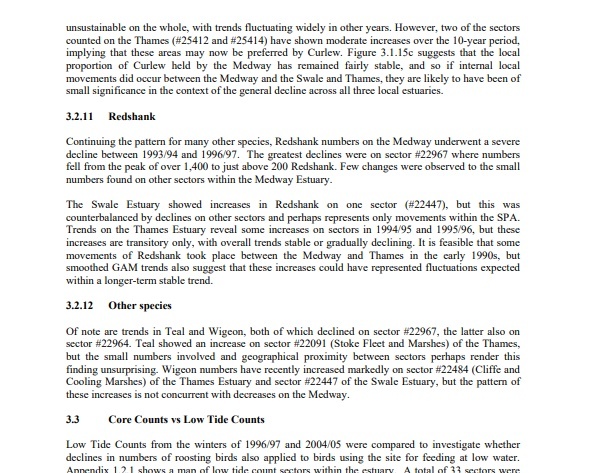 If you were surveying an area with Schedule One nesting birds, are you committing 'reckless disturbance' (the legalese) if you fail to act in accordance with that species' proscribed methodologies once those methodologies have been pointed out to you? Tricky; why best to try to stick to the published methods in the first place. I'll say it again; if you can put up with a lot of the birds on show being specks, and you haven't yet been to either of these viewpoints, do go. On a rising tide, or over a full tide (especially a spring) at this time of year. On a winter's afternoon, any time of tide. You really won't be disappointed. Just remember to take your 'scope. In 1951/52, attempts were made to count a winter roost of Bramblings in Switzerland. 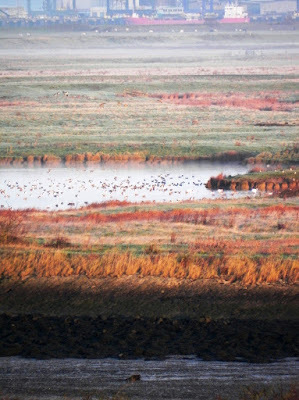 One stream into the roost was estimated to hold around 36 million birds. To quote from Newton's 'NN 'Finches', "..however, only about half the birds could be seen from the observation points, so the total number was probably at least 70 million.."
That is a lot of Bramblings. To a soft Kent birder, a three figure count would be impressive. 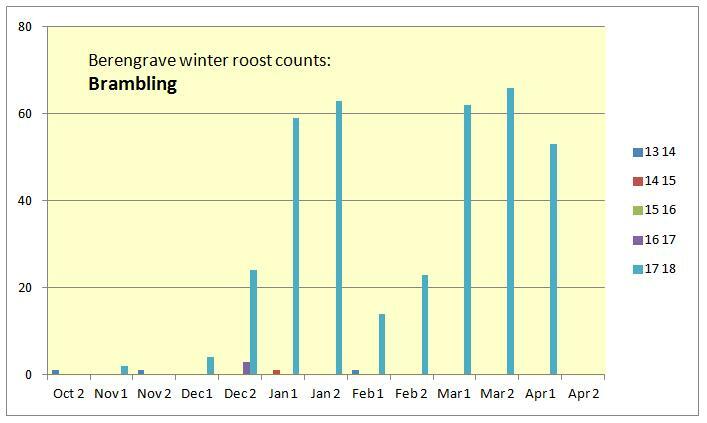 This winter, I have been more than happy with a number going to roost somewhat under that. Of course, I knew, like the Swiss, I probably wasn't counting the whole flock from my viewpoint, but it was fun to dream it could have been millions. Or a hundred. I'd have settled for counting a hundred. Go back to the 1980s, a regular spot for Brambling in the run of hard winters back then. I still have fond memories of trudging through the snow to see them, standing under the ivy covered trunks watching birds sneaking in. Since I moved back from East Sussex, I have been counting the Magpie roost at Berengrave. As mega-exciting as that sounds, I decided from the start to count everything that roosts (a series of links at the end of the blog will take you to past summaries for most of the more common species including Brambling). This year autumn passage on the estuary hinted at a small but slightly higher than usual passage and, sure enough, after a run of nigh-blank winters, I finally had some Brambling to look at. Not 70 million, not even 70, but it would do. I must be one of the few birders who routinely takes a telescope into an overgrown quarry. Simple fact of the matter, the birds were always at the northern end, the only decent viewpoint at the southern. The Magpie count period has always been a set timed count from 60 minutes pre-sunset to 30 after. 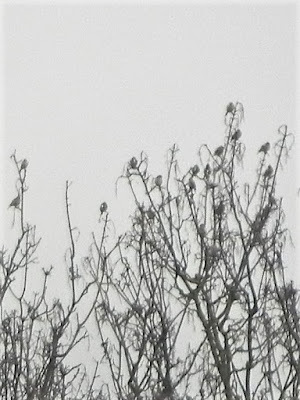 The finches often start arriving before that so, on arrival, a scan of the distant tree line would often find a mix of species up on display. When I say mix, there tended to be a general clumping of one species over another. Chaffinch, in the largest numbers, were all through the higher trees but the Goldfinches and Bramblings would be in tens, twenties, both having favourite trees and both able to flight without taking any of the other flocks with them. Unlike the Magpies, the finch show would be over by sunset. Usually roughly twenty minutes before when the various groups would drop into lower branches. Mainly without any fuss, only sometimes, especially later in the season, making a few circuits of the Pit before piling in. Another interesting difference was that during the coldest part of the year perching in the tree tops would still happen, but for much, much shorter periods. Any urge to advertise the roost to newbies was overridden by an urge to secure a good spot. Arrival was almost always from the north, and mainly the north-east. This put the majority on a flightpath back to what I discovered to be their favourite local food source. 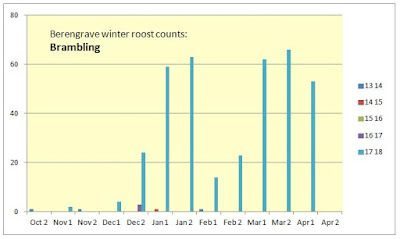 Taking winter as December 1st to February 28th, sightings were clustered around the main early season food source before spreading to a later winter support system of gardens. The initial attraction was not, as the field guides would have it, beech mast, but brassica, in game cover crops. Looking at 'BWP', brassica is a source many switch to when the mast runs out. There was clearly enough good feeding on these local farms, with safe roosting nearby, to keep a few birds present all winter. Sadly, I was hampered by my early December operation and did not get to search the eastern end of the shore as often as I would have liked; Brambling arriving at the other more easterly roost I did visit tended to fly from the north-west and north-east, so were also no doubt also taking advantage of local cover crops; another local farmer more to the east always has them in his cover crops when they are in the county. Another site for me to check up on in the next good winter. Many texts hint at late winter hard weather movements. My set counts might very well hint at such a thing, but I can't say for sure. I found myself asking another question instead. Go back to that monster Swiss roost. The actual count was never the number of birds present. That had to be estimated. In no way do I think my counts were the true number present. Just a nice comparison of relative numbers throughout the winter. But because my site is a b*gg*r to view, and with birds dropping down much more quickly during the coldest periods, could it be I missed more birds in the cold than the mild? My primary reason for counting here is, after all, the Magpies, so I never kept my eyes glued to the finches' favoured pre-roost perches. Did more sneak in past me at this time? Was the drop as strong as suggested by the graph? Which had me thinking on other aspects of Brambling wintering behaviour and movement where the texts tend to differ a little. Unlike other finches, Brambling are not, in the main, diurnal migrants; many birds, some texts suggest the vast majority, actually move at night. (BWP makes an intriguing statement that most diurnal movement takes place overland, while more nocturnal movements are over large water bodies. Years later the Migration Atlas states '..Brambling movements are often nocturnal and may leave exhausted stragglers grounded at the coast during the day..') The best bet is that we often just pick up on early morning stragglers or daytime adjusting movements; why, on a good autumn morning, we never have more than a handful in comparison to Chaffinches. Those late winter second pushes into the U.K. from the continent; how much evidence actually exists? 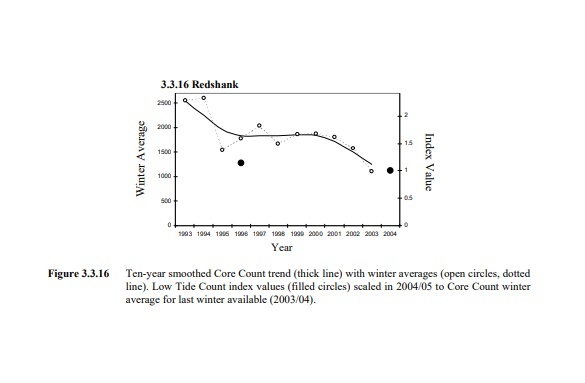 Why couldn't late winter peaks be birds adjusting from, say, already within the U.K.? Again, the Migration Atlas "..weather conditions may bring new arrivals from the Continent in mid-winter, often in substantial numbers.." referencing the Birds of Norfolk, but intra-seasonal ringing controls that back this up are lacking somewhat, plus, on reading that referenced species account the mid-winter flight directions are mentioned, but none suggest an 'in-off'; movements south through that county could just as easily be birds already in the U.K. The probability is good, but there is still much to confirm. 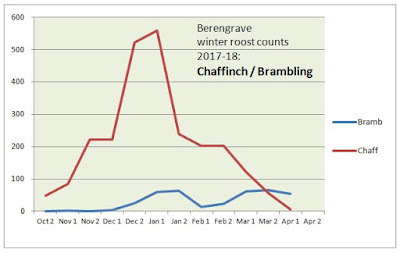 A direct comparison of Chaffinch vs. Brambling shows a typical Chaffinch curve, albeit steeper than usual thanks to higher numbers. A continued rise into December as the migrants find the better roosts/feeding areas, a decrease after New Year as winter bites, then a drop from March onwards as the locals move out to set up territories and the winterers start to feel migratory restlessness setting in; Chaffinch move a few weeks before Brambling. Makes sense, Brambling being the more northerly breeder, no need to move off quite as quickly; those breeding in, say, northern Finland, can't really get started there until warm enough in mid-, late- May. Their diet becomes more insectivorous, why risk getting back there and finding everything still frozen if there's still food available further south? Why some texts hint at their peak departures from here being mid-April, a fortnight or so after the Chaffinch peaks. Having a trawl around the internet, I found a couple of interesting papers on work on migratory cues for Bramblings. In one experiment, birds were kept under artificial light set to short (winter) daylengths. These lights were switched abruptly to 14.5 hours. It was like turning the dial up to eleven. Within three days, the birds had developed migratory restlessness. Zugunruhe. Fat deposits grew. So, effectively by mid- to late-April, migratory condition in Bramblings should be well advanced. Doesn't mean they all move at once, the texts say they stay in some number throughout the month.So why do we see less and less? Migration Atlas hints at an answer. Large flocks may have short-hopped to the continent, or they may have dispersed. Diet again. Stalling an early arrival on snowy breeding grounds again. So, we might not be able to see them go. Do we know when they really do leave? Newton, in New Nats, stated British winterers move early March to April. What have our county avifaunas said? Norfolk (Taylor): "..April records are now not at all unusual and large flocks can occur.. can still be present in good numbers into early April.. most tend to have slipped away by the middle of April.. coastal passage in the spring is much less noticeable than in the autumn.."
Suffolk (Piotrowski): "..pre-emigrating flocks.. ..feeding flocks are frequently reported until early May.."
Essex (Wood): "..the status of those birds occurring in the county from March onwards is unclear. Many are probably wintering birds, but it is likely that from the end of March there is an increasing number of returning migrants involved..
London (Self): "..several influxes during the middle of winter.."
Surrey (Wheatley): "..some evidence of passage March and larger arrivals in January.."
Kent (Taylor) "..small, but often noticeable spring passage, usually indicated by the presence of temporary flocks, during March-April.."
Sussex (James): "..a small spring passage is evident from mid-February onwards.."
(Thomas): "..spring passage is much less noticeable than in autumn.."
Where specific, not exactly any consensus among the local counties then. 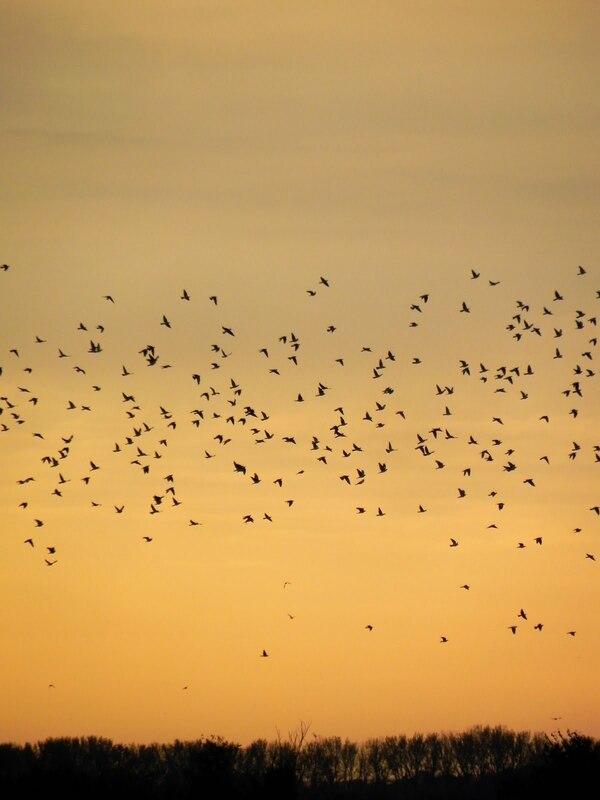 Nationally, the Migration Atlas goes for "..large wintering flocks have typically dispersed or returned to the continent by mid-April.." so, they may or may not have left. It also asks if late April/early May birds on the coast are late leavers or passage birds heading up from south-west Europe. We really still don't know as much as we like to think we do. Among the county avifaunas, as always, for me, Wood stands out (fnarr). It makes plain we don't really know, and hints at what might be going on. Why when anyone asks me what's the best text on birds for Kent, I always say 'Birds of Essex'. I've always stated outstanding for esturine birds, but it also really works for a lot more species as well. Not much left for me to do now this season. Just the one Magpie count left, in second half of April, but I'm already geared up for a nil return on Brambling, if only because my allotment backs onto the northern edge of their assembly area, and this past week I've not been hearing any in the late afternoons- or will they prove me wrong? Who would guess forecasting negative data for a common species could be so much fun? Welcome to the south shore of the Medway Estuary! 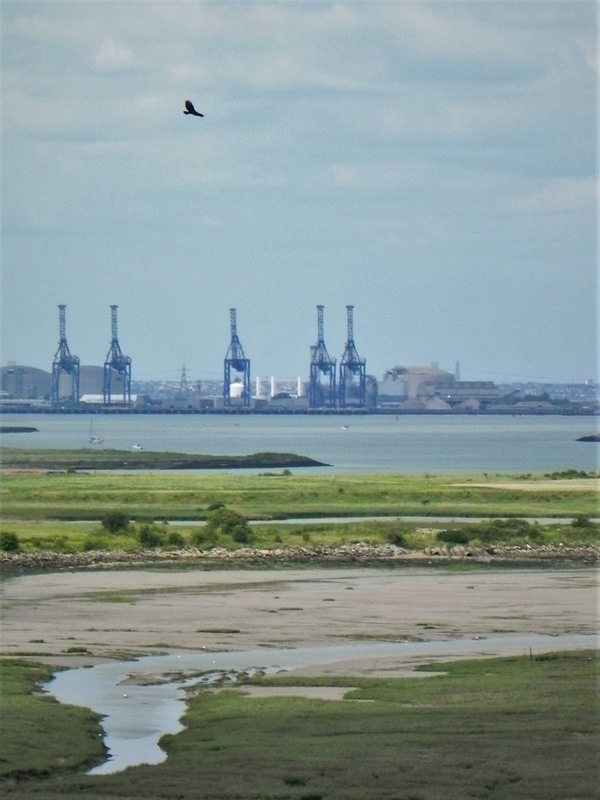 Birding from the estuary head at St. Mary's Island, Chatham, out to the estuary mouth just above Queenborough Spit-some eighteen or so miles of seawall within the North Kent Marshes. Please don't expect quality writing, quality photographs, or even quality birds. 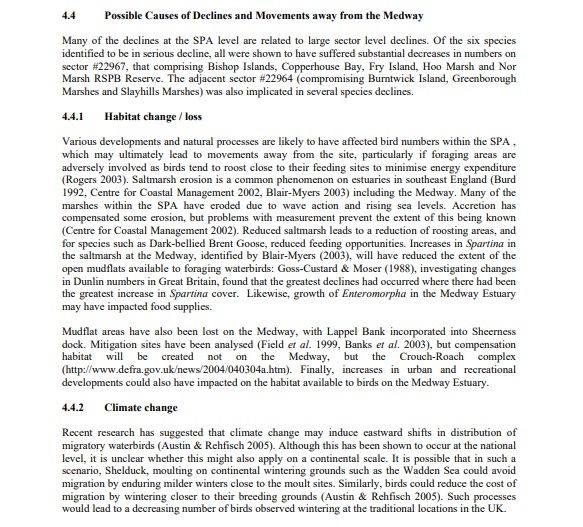 I'm just blogging for myself, trying to understand the estuary better, focusing on the common species found here. Hopefully these ramblings will be of interest to some of you.